The aurora borealis (Northern Lights) over Glendale in April 2012. 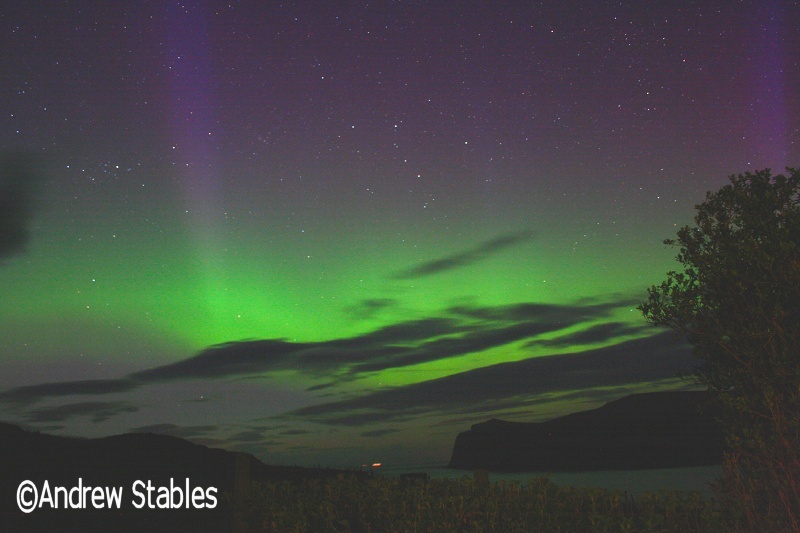 The Northern Lights can provide an amazing spectacle in the Winter months. The incredible, shifting columns of light appear like search lights in the skies over Glendale. 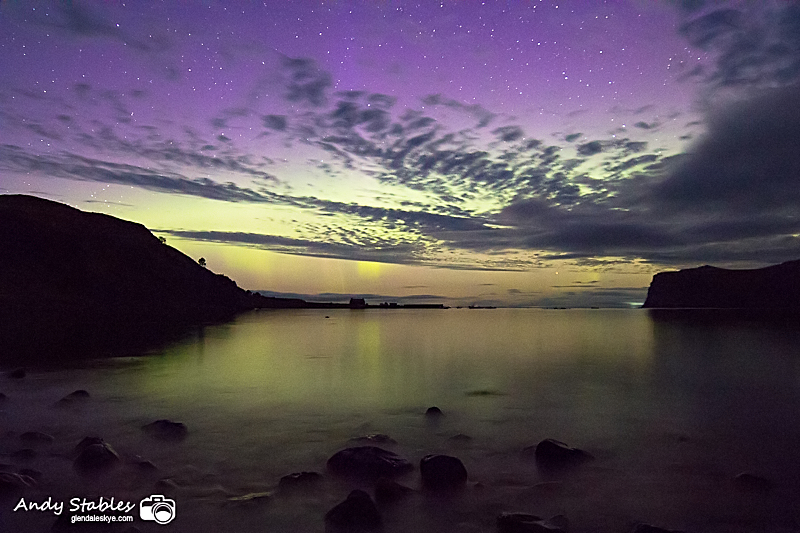 Most auroras on the Isle of Skye appear white to the eye. It is extremely rare for colours to be visible at this latitude (57.5° North). 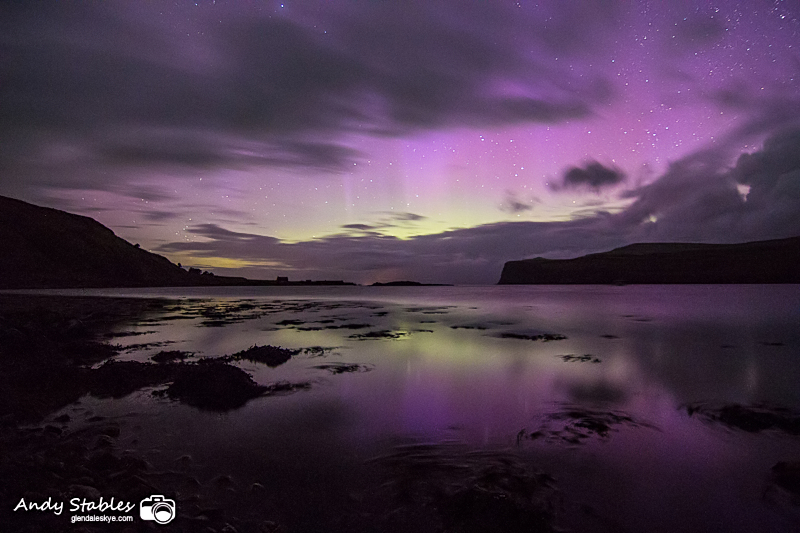 The spectacular colours reveal themselves when the aurora is photographed using a long exposure. 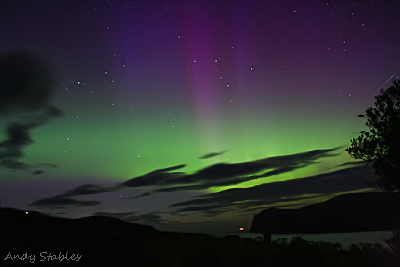 Auroras are not visible in Glendale during June and July due to astronomical twilight never ending, i.e. the sun does not go far enough below the horizon for the sky to become properly dark. 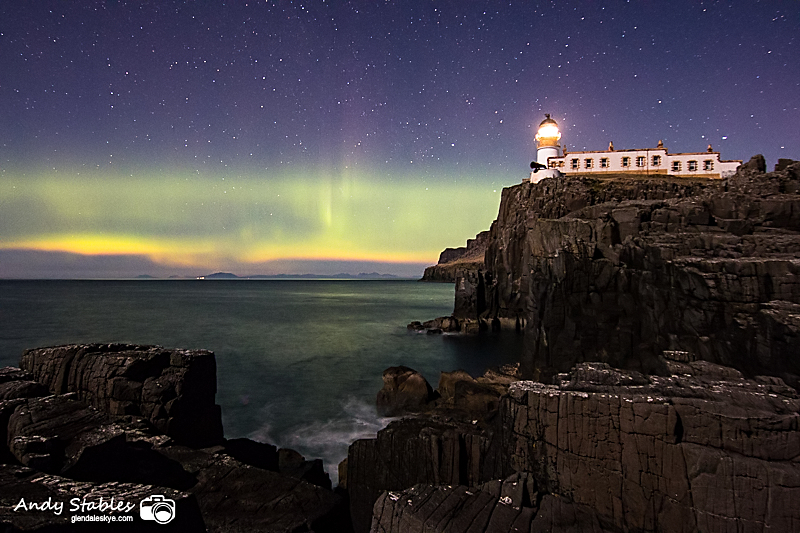 For answers to commonly asked questions about aurora-watching, detailed advice on how to photograph them and how to receive alerts see my FAQ page at Aurora FAQs. 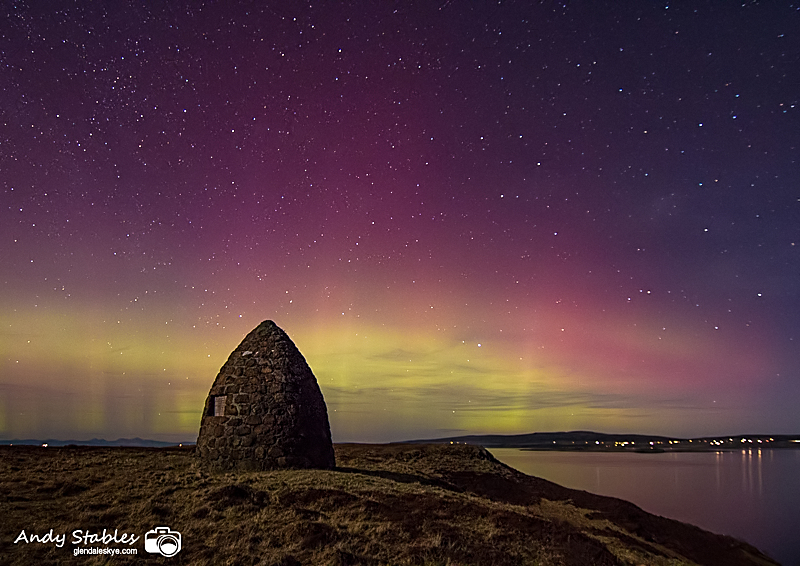 You can sign up to receive alerts directly to your mobile phone when there is an aurora here in Glendale by following the twitter feed at : https://twitter.com/SkyeAuroras and enabling SMS notifications. 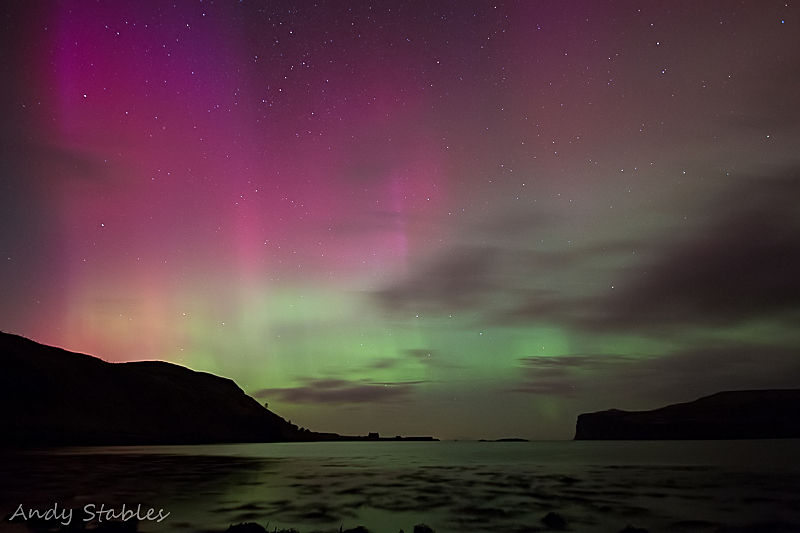 For more details see the Facebook page Glendale Skye Auroras, which I have set up to post alerts and photos. 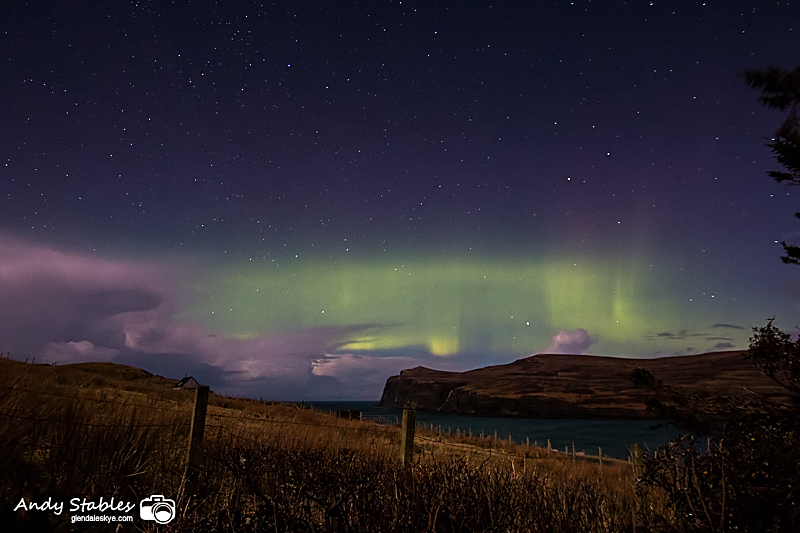 Remember to "like" the page if you want to receive news and advance warning about auroras on Skye. Below are sample photographs from some of the best auroras and noctilucent clouds that have been visible in Glendale since September 2011, as you will see some nights are vastly better than others. 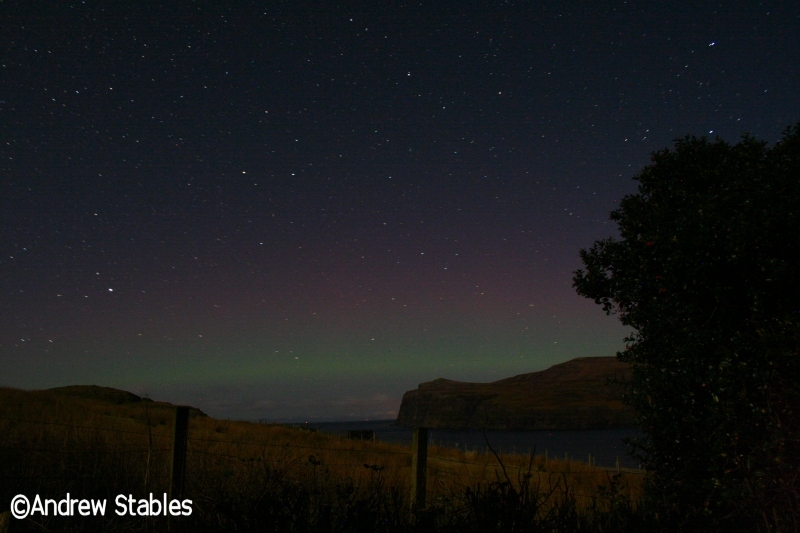 A full catalogue of aurora & NLC photos, arranged into albums for each night, can be found at Aurora Albums. 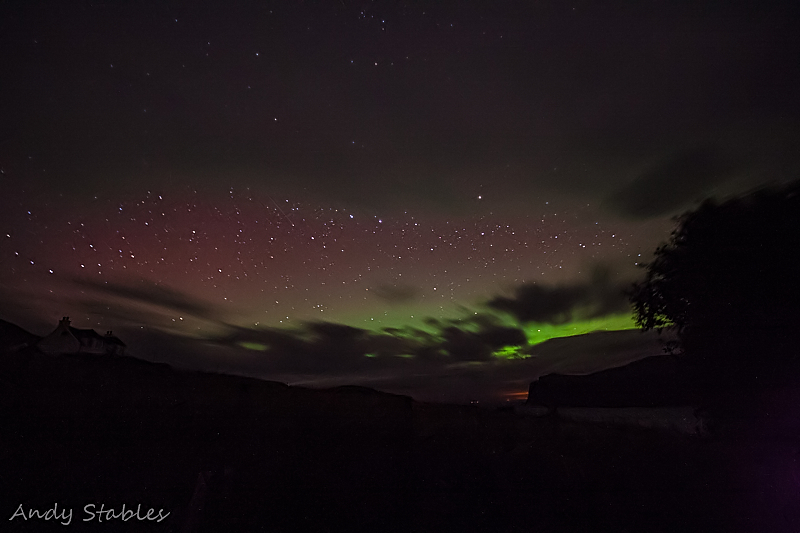 There was a nice aurora all night but peaking around 1am. 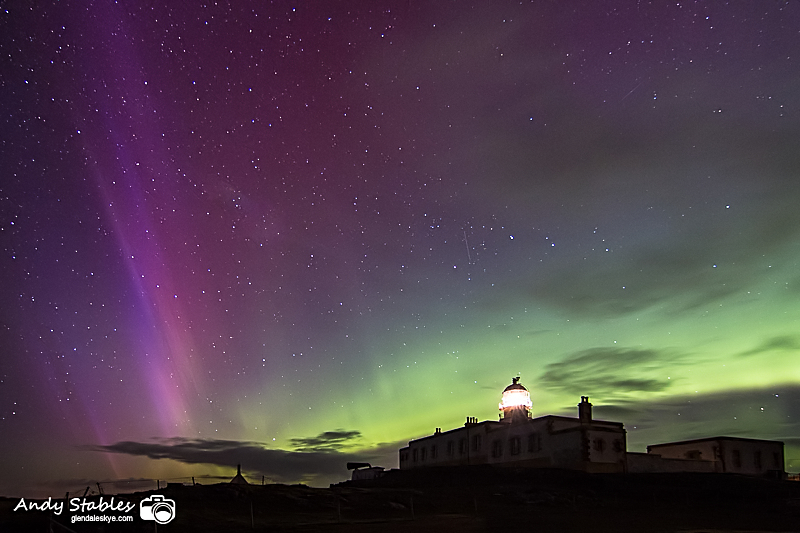 There was a stunning Christmas Day aurora at 6:10pm. 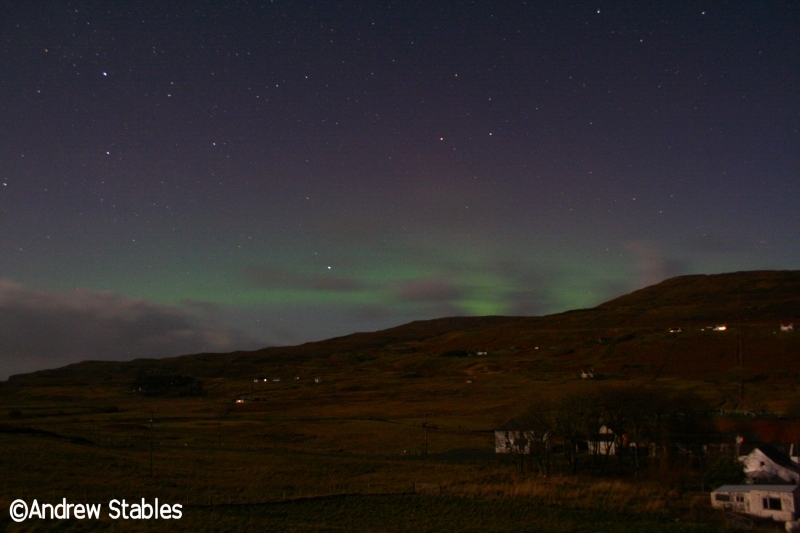 There was a nice aurora which peaked between 23:30 pm and midnight. 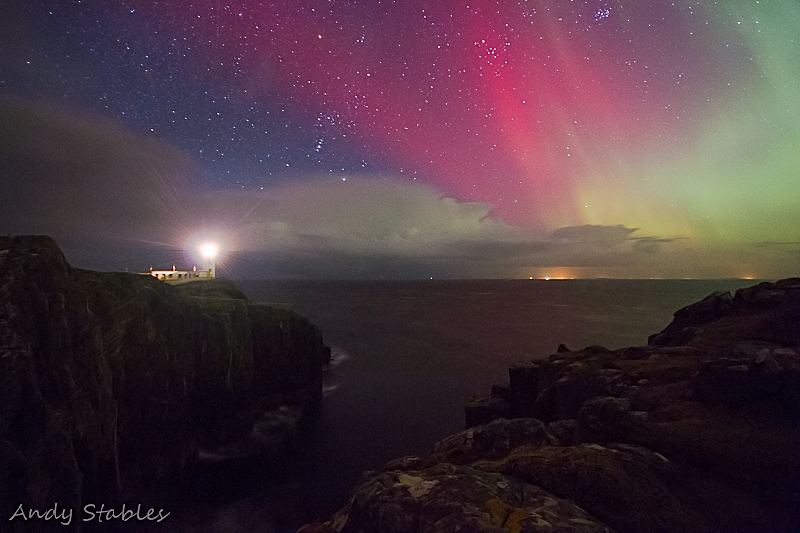 There was another nice aurora from 10:45pm on the 23rd through the night into the morning of the 24th. 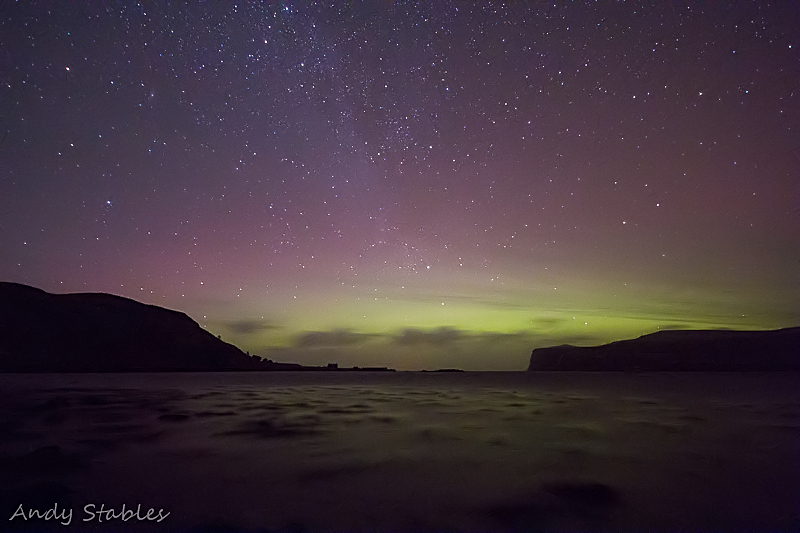 There was a nice aurora from 1am until 2am. 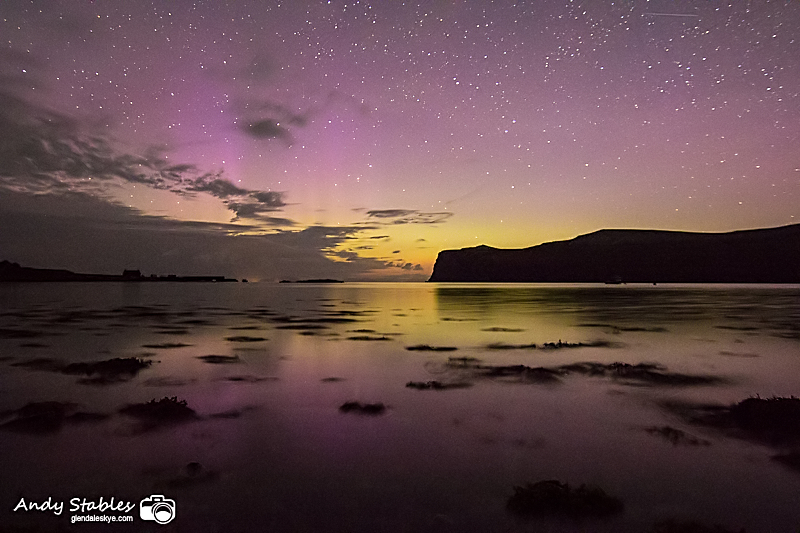 This is the fourth aurora of the new season and 49th for the year so far. The earth is currently experiencing some massive meteors from the Perseid Shower. 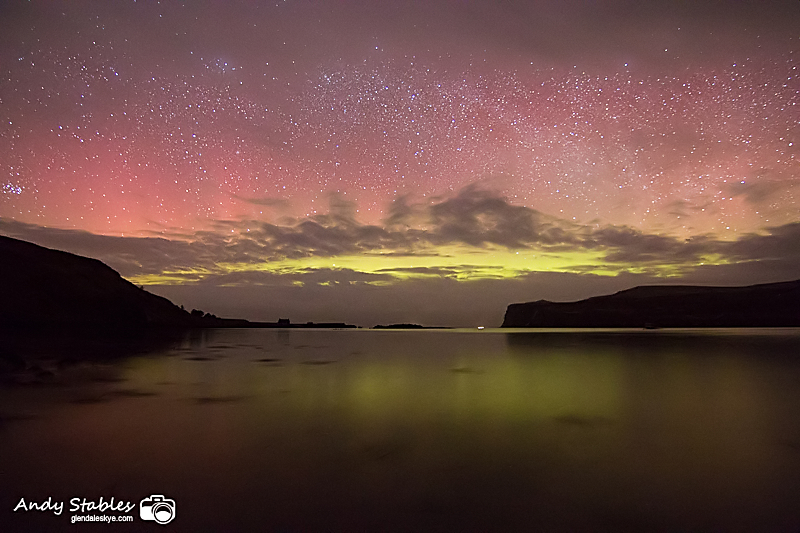 This was one taken at 2:30am with a gold aurora. 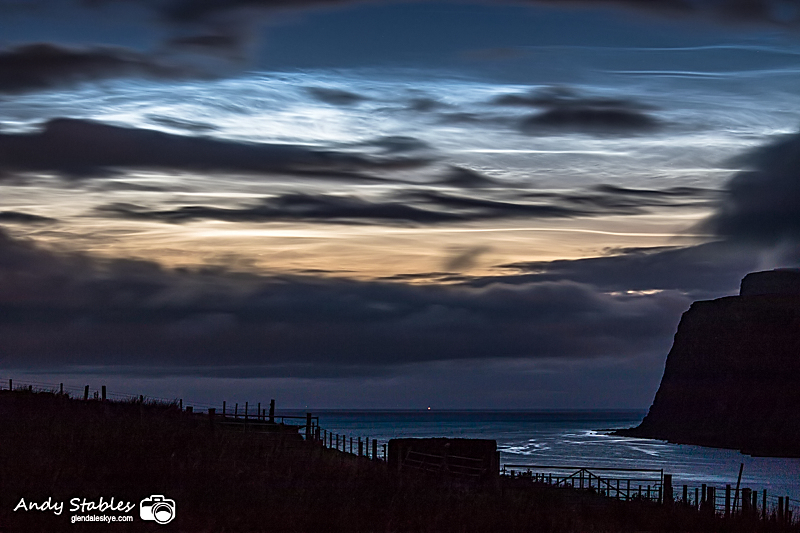 There was an exceptionally late display of noctilucent clouds in the early hours of the morning, peaking at 2:30am. Just when we thought the season was over. 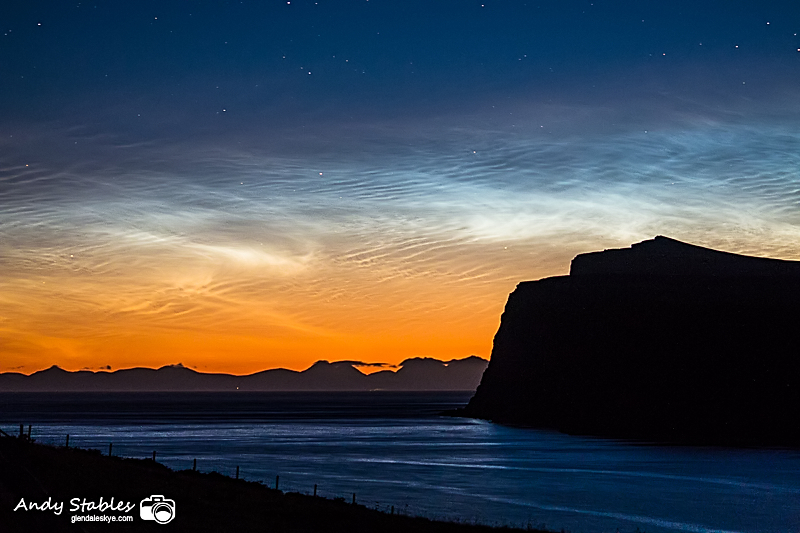 We had the best display of noctilucent clouds so far this summer at 1am. They have been very elusive this year. 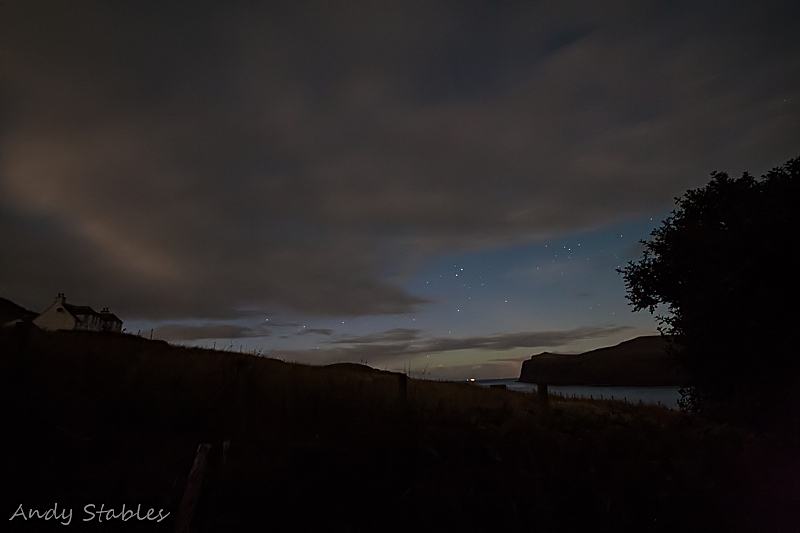 There was a nice aurora as soon as it got dark. 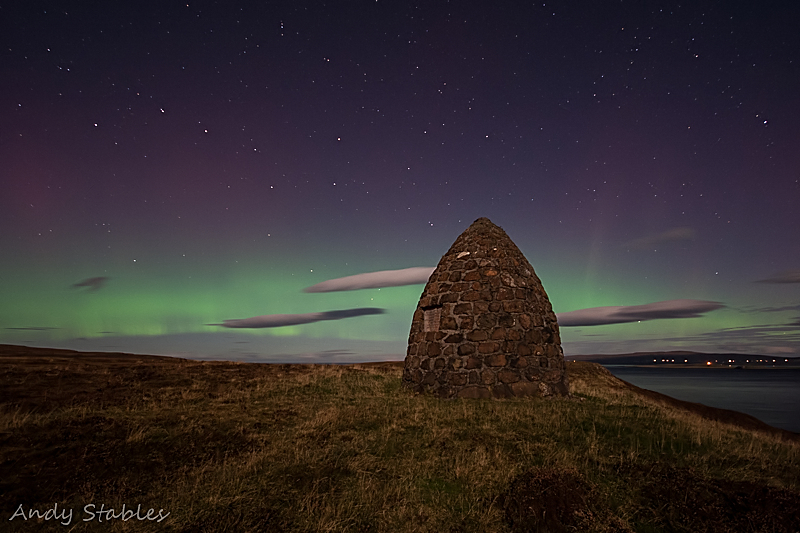 There was a fantastic aurora tonight. 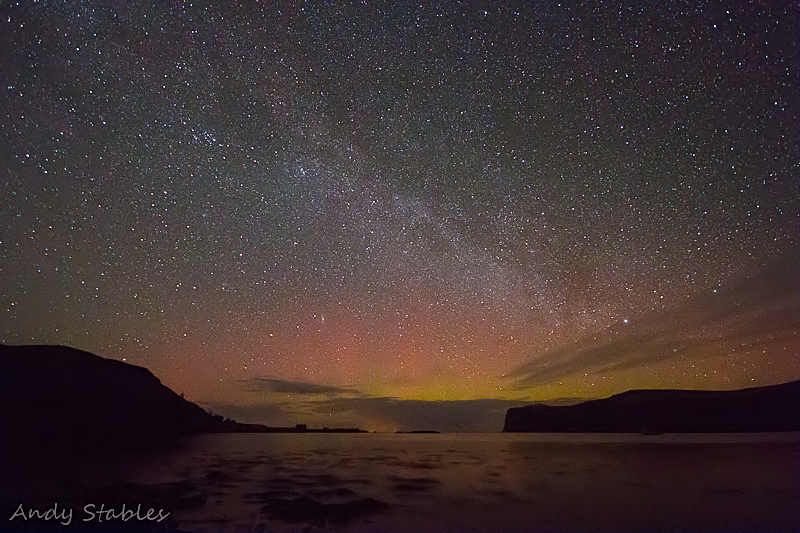 There was an aurora most of the night but with a period of strong colour to the naked eye just after 10pm. 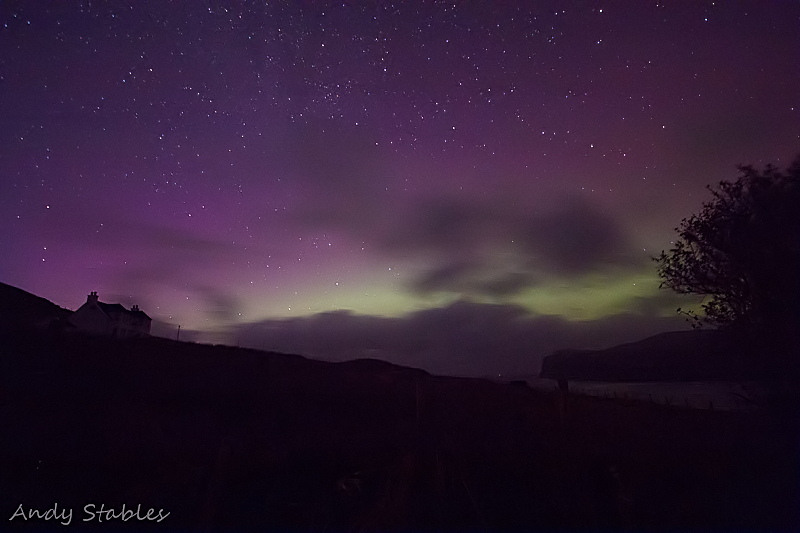 There was a very bright but fairly static aurora on the night of 11th/12th. 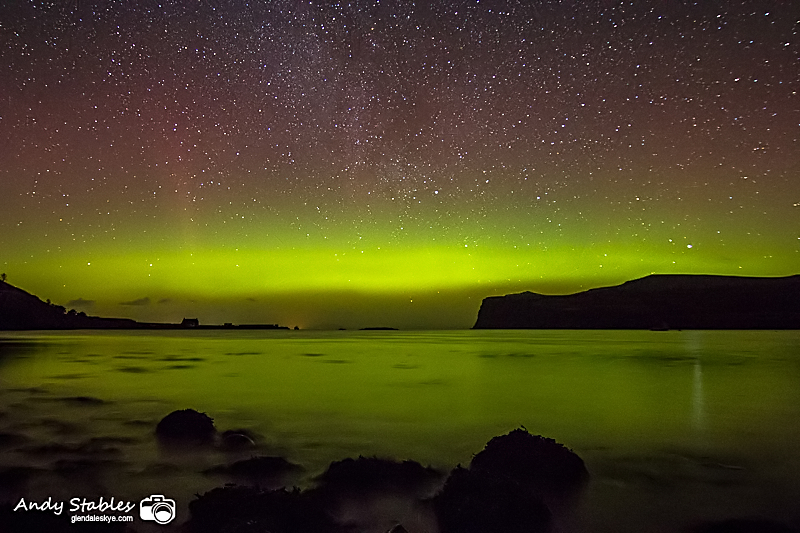 There was an exceptional aurora to see in the New Year, which started around 7pm on Hogmanay and peaked from 11:45 until 1:30am. 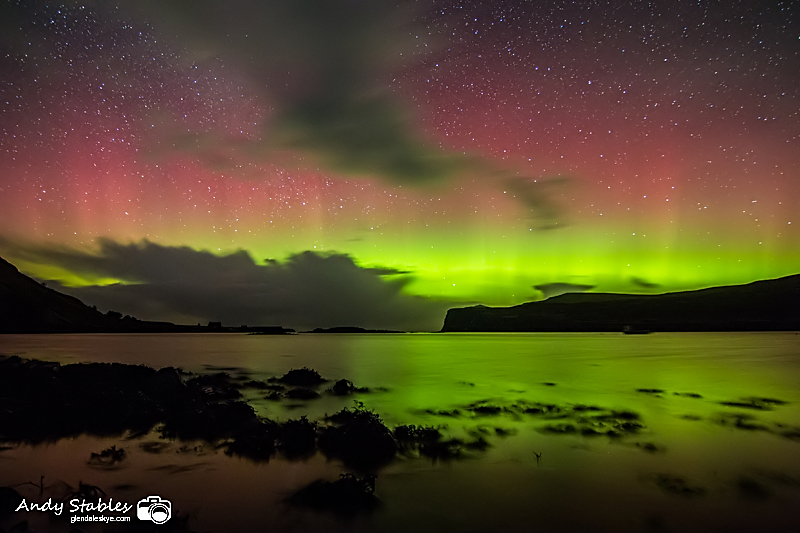 The strongest aurora of 2015 tonight was photographed over the entire United Kingdom. 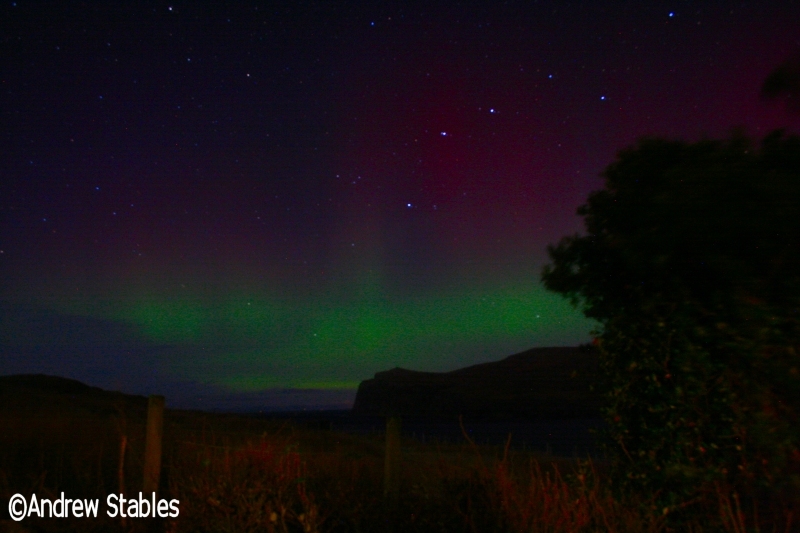 The aurora was passing directly overhead just after midnight. 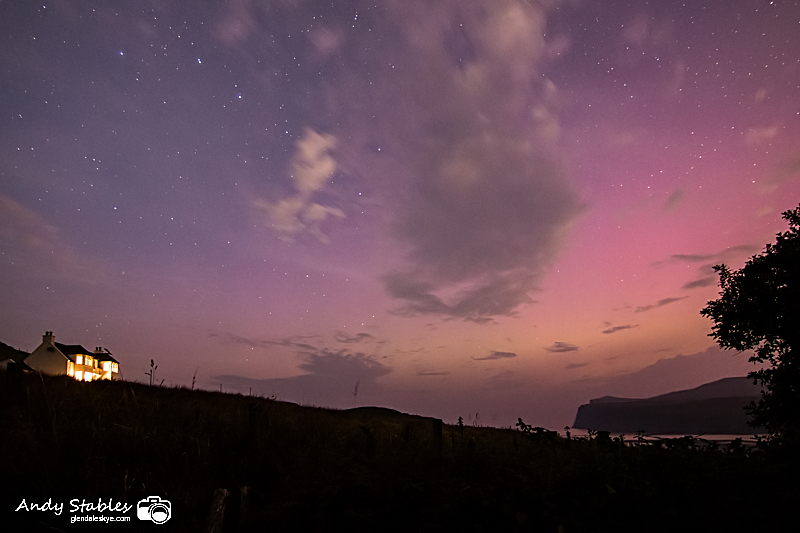 There was one of the strongest auroras of the year tonight. 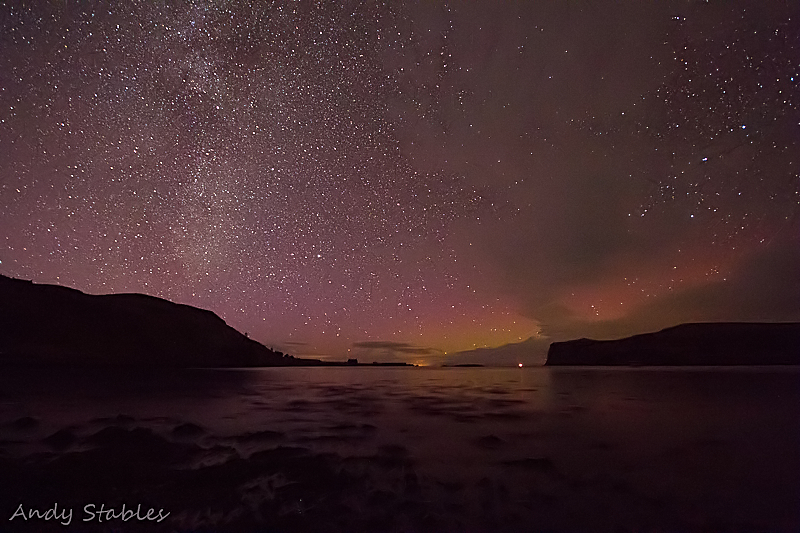 There was a nice, low aurora, strongly visible in monochrome to the naked eye, from 1:30am onwards. 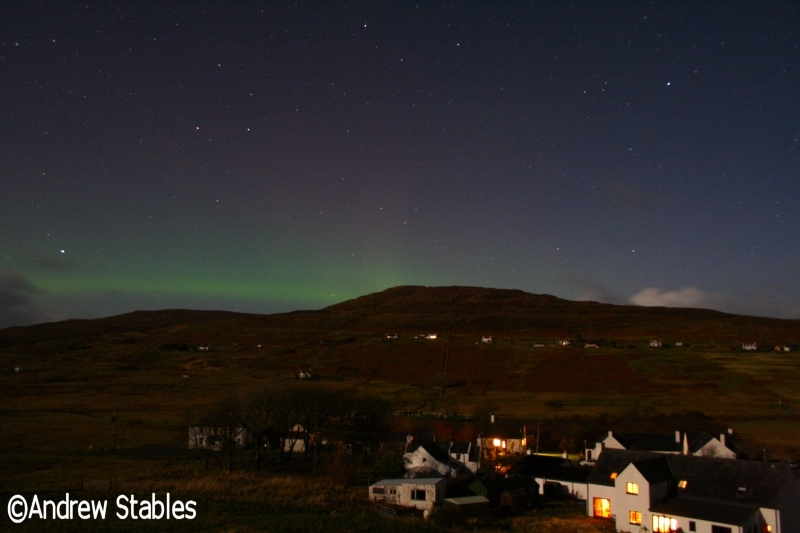 There was a spectacular aurora from 7:50pm onwards. 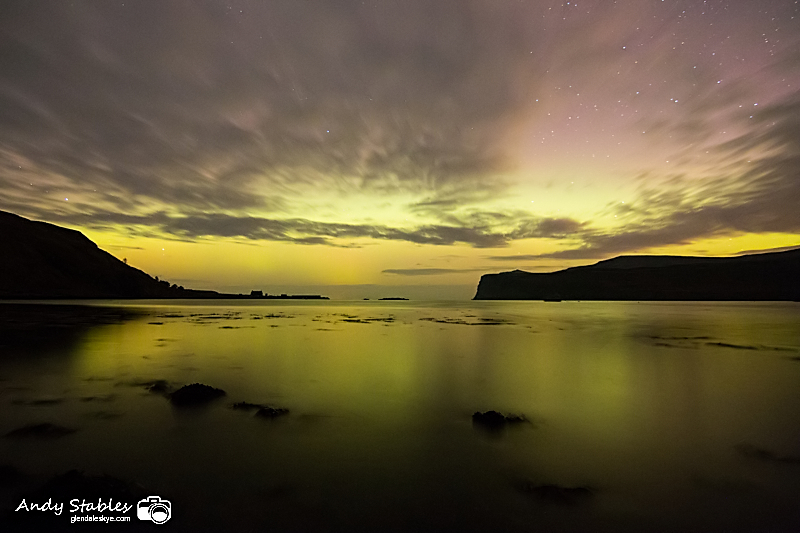 There was a rare clear sky from midnight, which allowed us to capture a nice aurora. 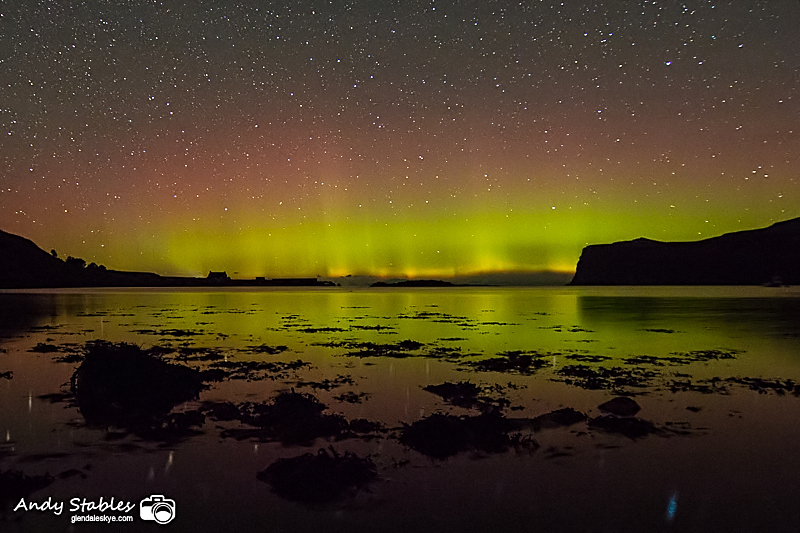 There was a major aurora from 9:10pm until 1am. 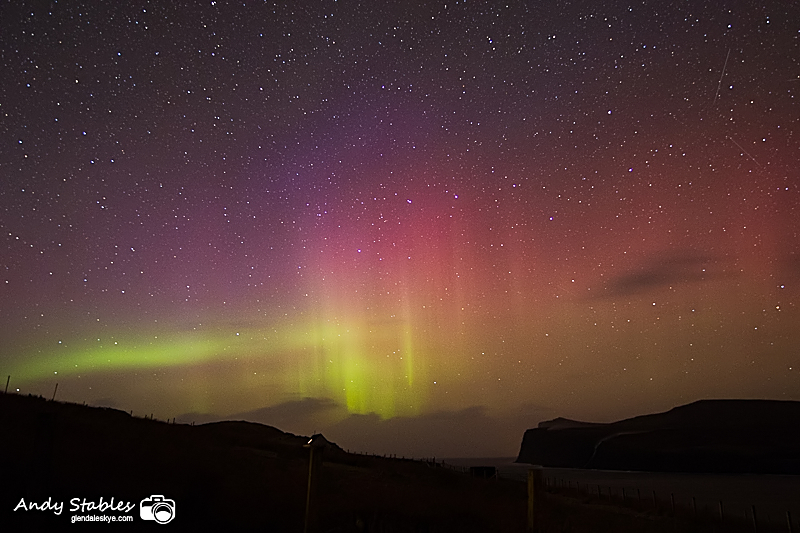 There was a beautiful aurora from 10:30pm until around 1am, with periods when the aurora was in full colour to the naked eye. 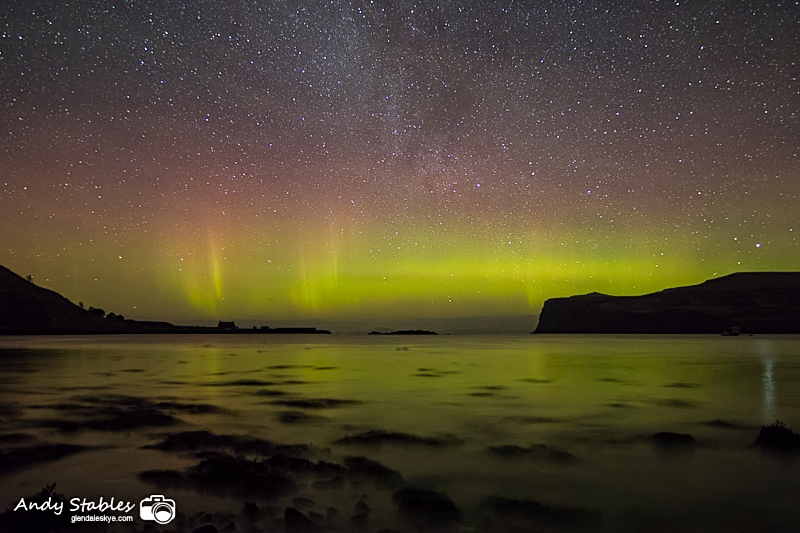 There was an amazing display of airglow, with an aurora and a meteor shower in the early hours of the morning. 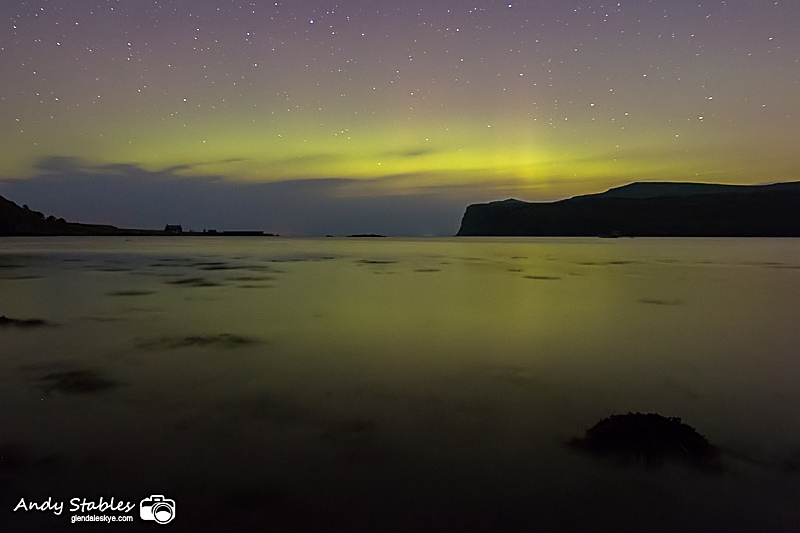 We had the first decent aurora of the season in the early hours of the morning. 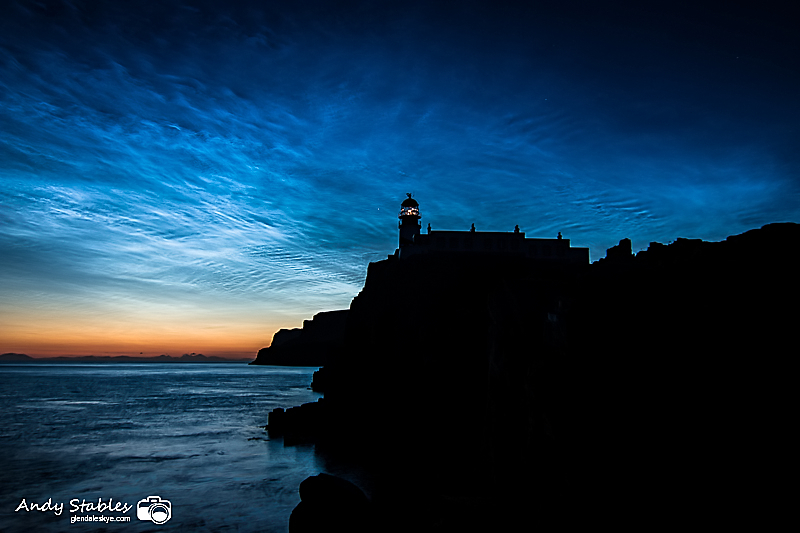 The sixth night with Noctilucent Clouds proved to be the best yet this season between 00:00 BST and 02:00 BST. 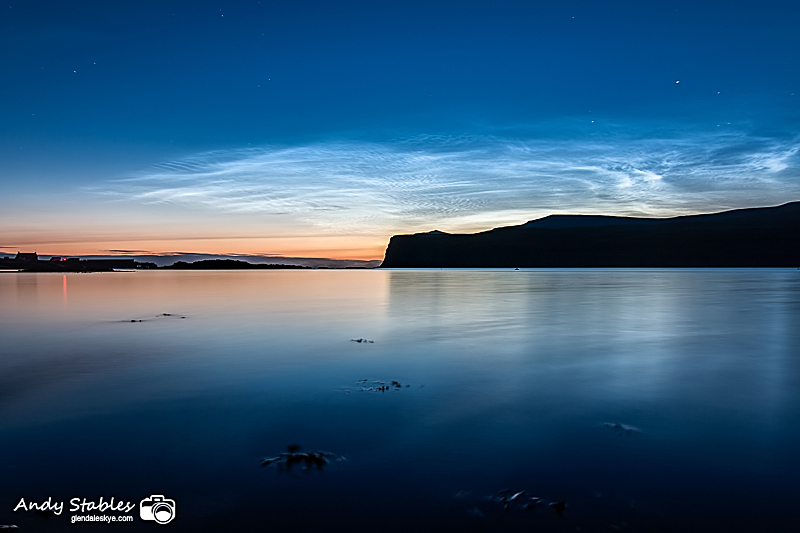 The first noctilucent clouds of 2015 were showing from 00:45 BST onwards. 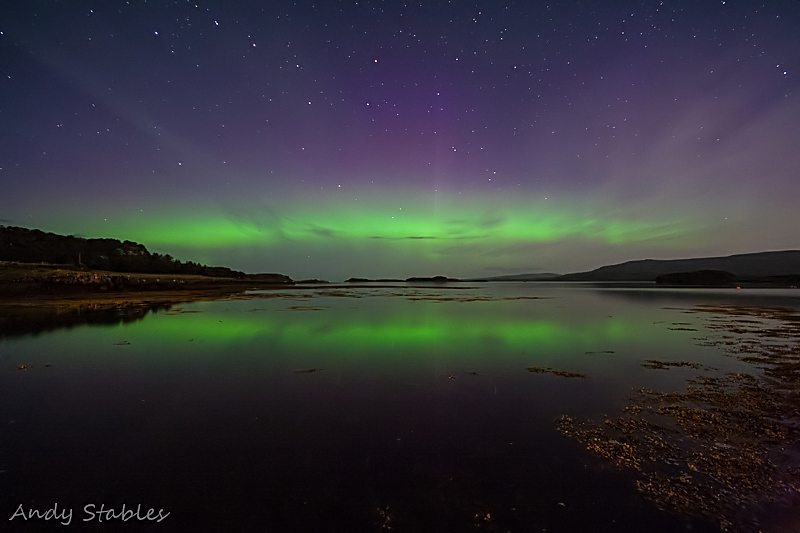 There was another nice aurora tonight, with three good shows from dusk until 1am. 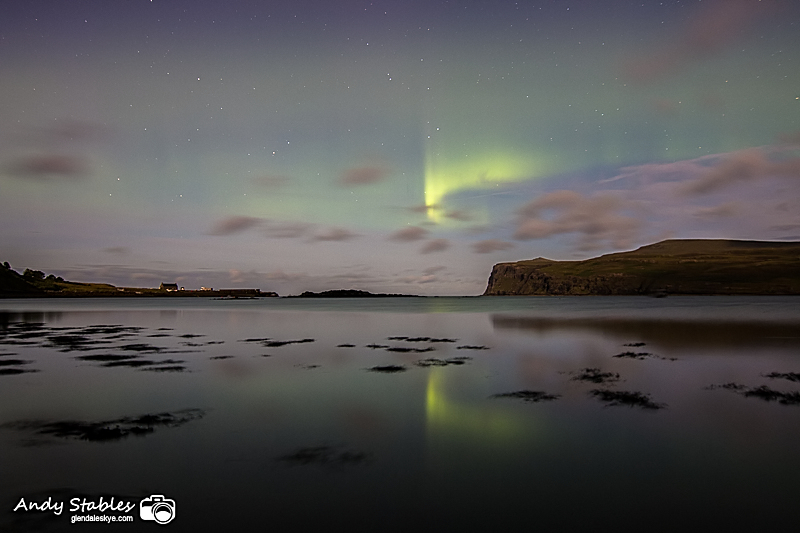 There was a nice aurora from 5:40pm until 8pm, when the moon killed it. 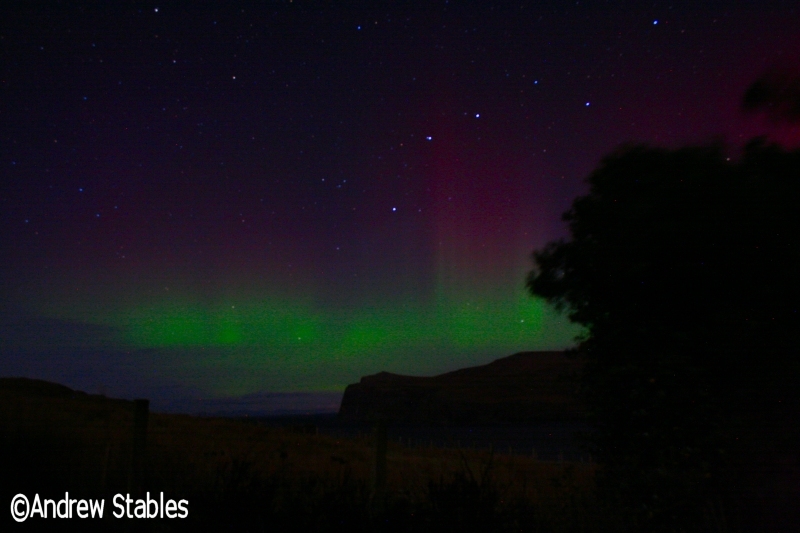 There was another beautiful aurora borealis. 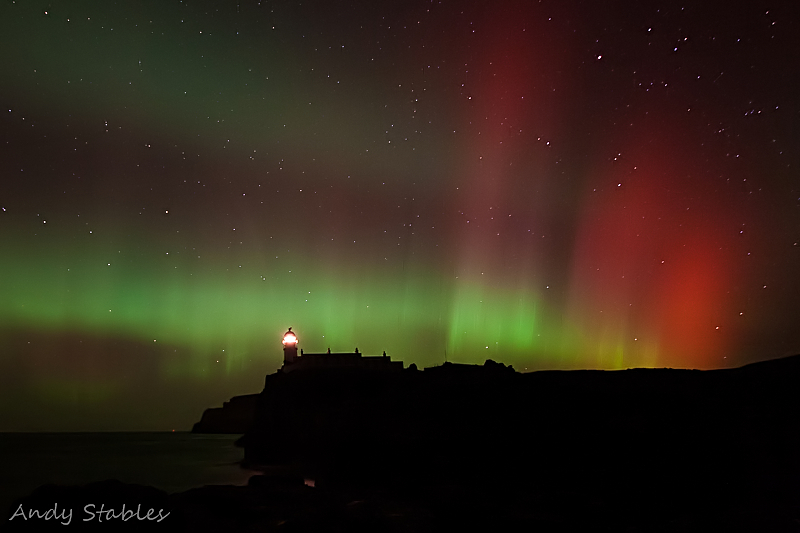 We've had auroras on the last seven consecutive nights. These pics are some of the best ones from Tuesday night's display. 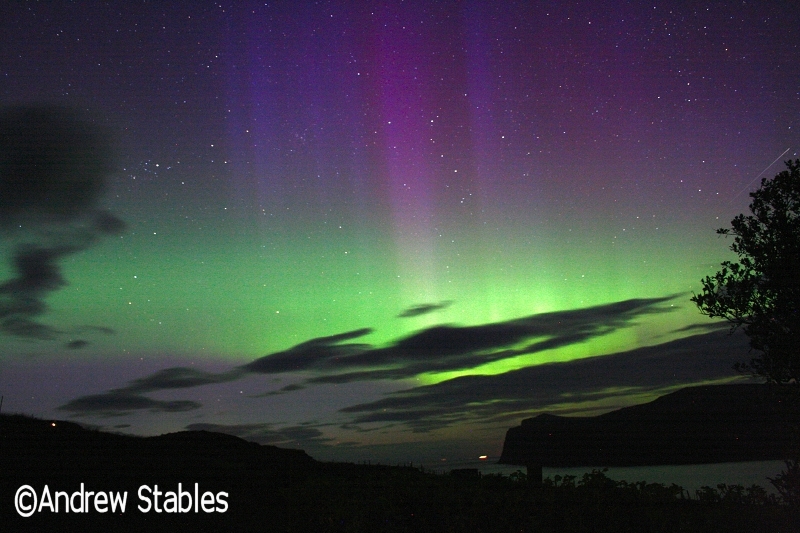 There was another beautiful aurora borealis that started at 9:30pm and went on all night, getting stronger after 1am. 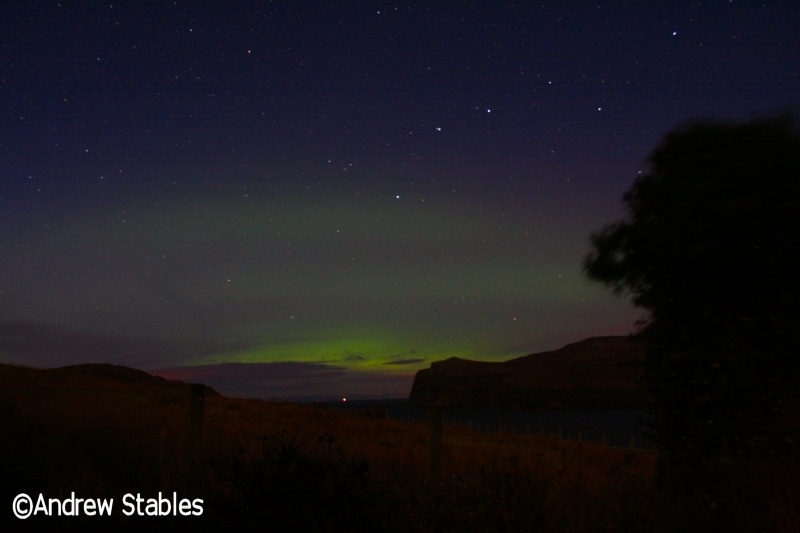 There was a beautiful aurora from 9:35pm until midnight, although hampered by haar and moonlight. 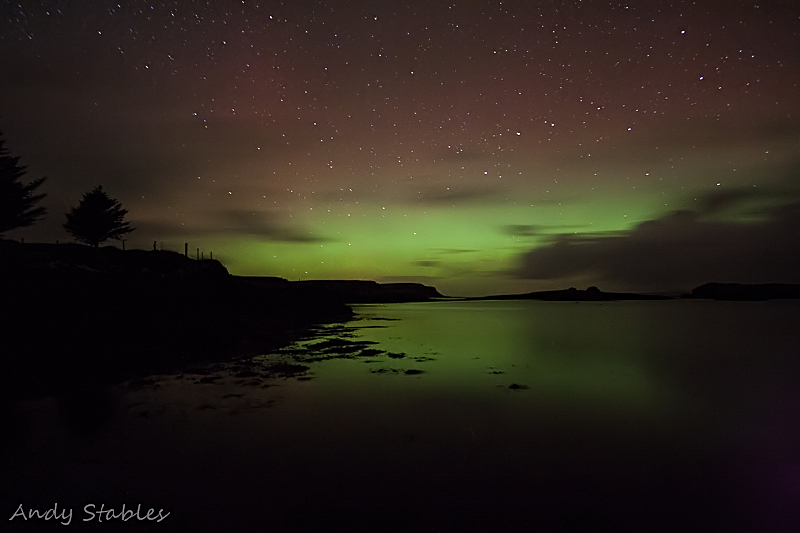 There was another beautiful aurora at around 12:30am. 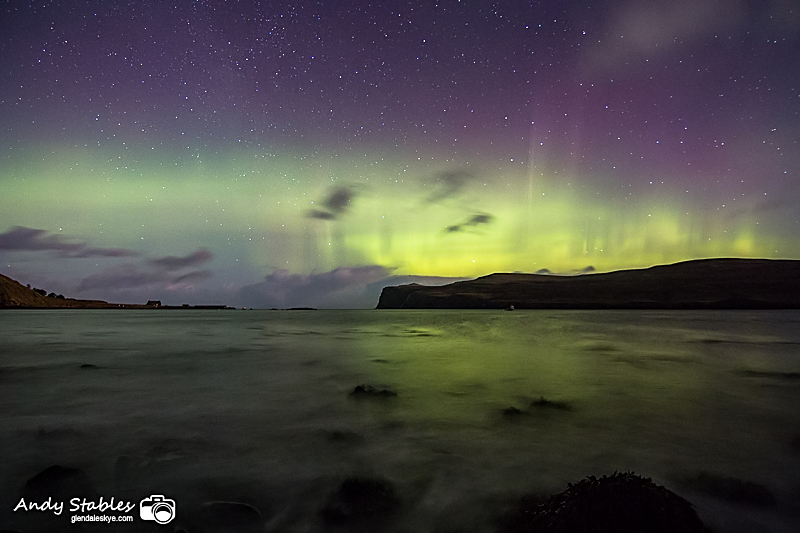 There was a beautiful aurora borealis in the early hours of the morning. The show began at around 10:45pm but didn't get really good until 12:50am onwards. 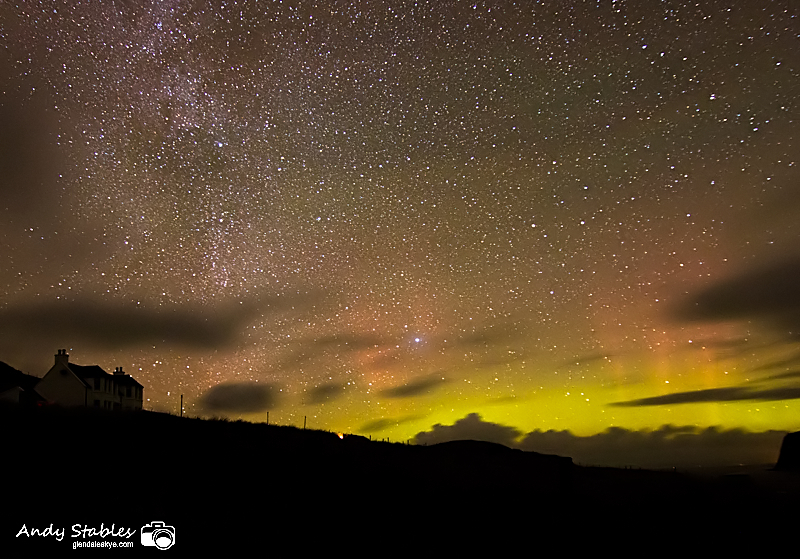 There have also been a couple of other much weaker auroras so far this month. 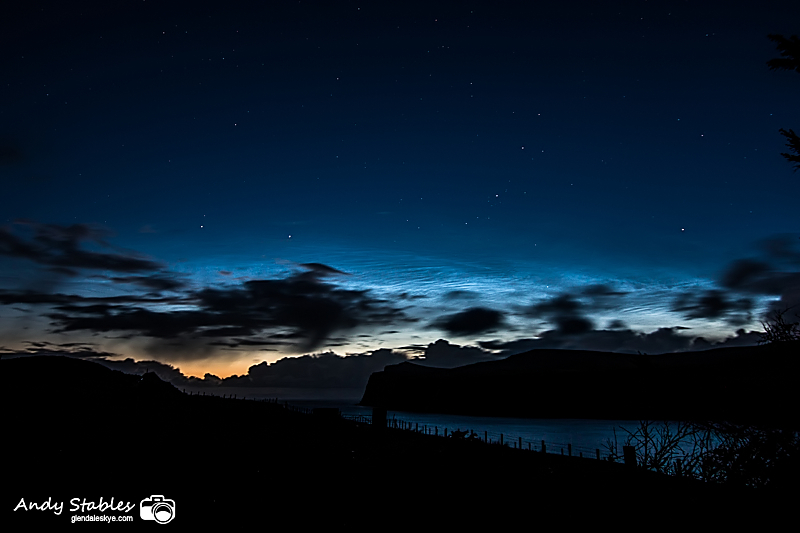 There was a major display of Noctilucent Cloud this morning from 1am until 2:30am. 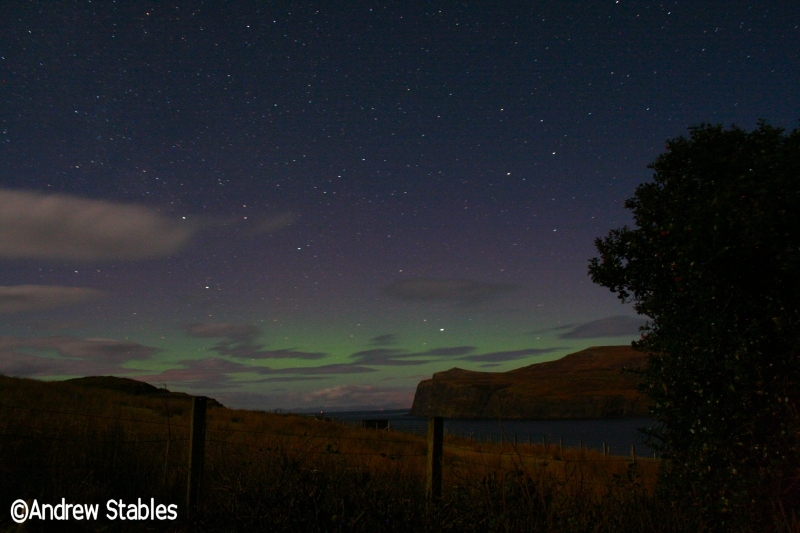 There was a beautiful aurora borealis from 11pm last night (20th) until around 2:30am. 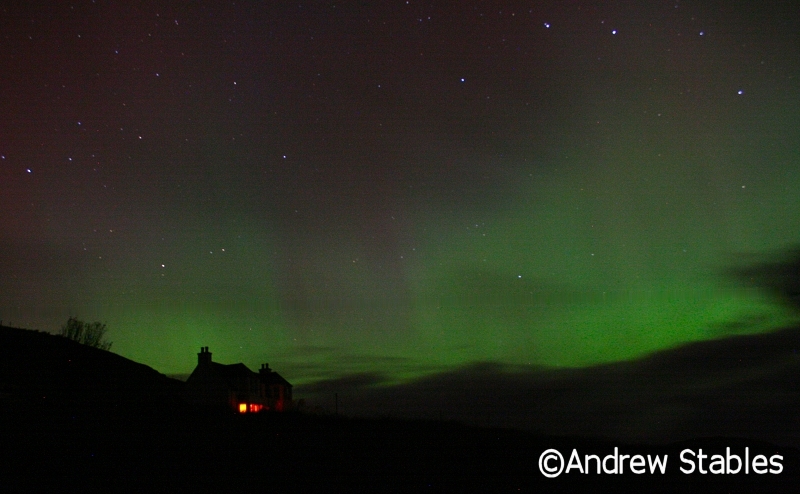 There was a beautiful aurora borealis from 10:50pm onwards. 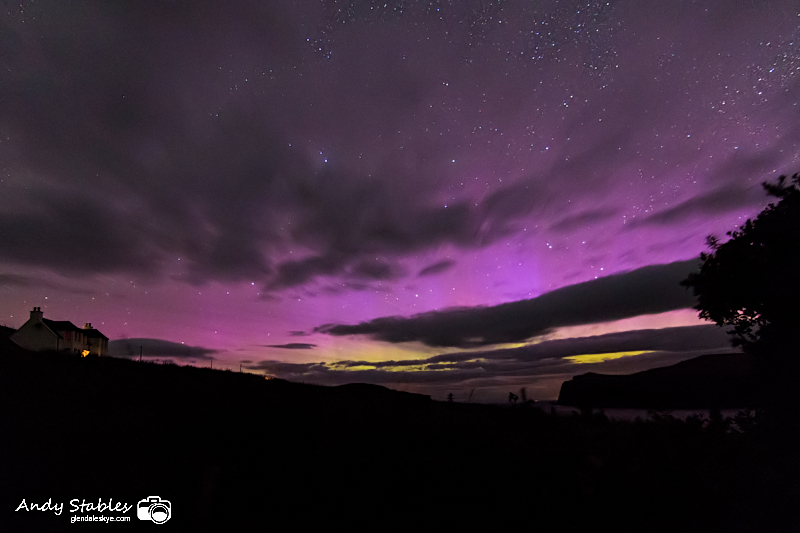 For anyone that isn't following the Glendale Skye Auroras Facebook page, here are some of my photos from Thursday's aurora, which was ranked as G2 and one of the best displays ever seen in Glendale. 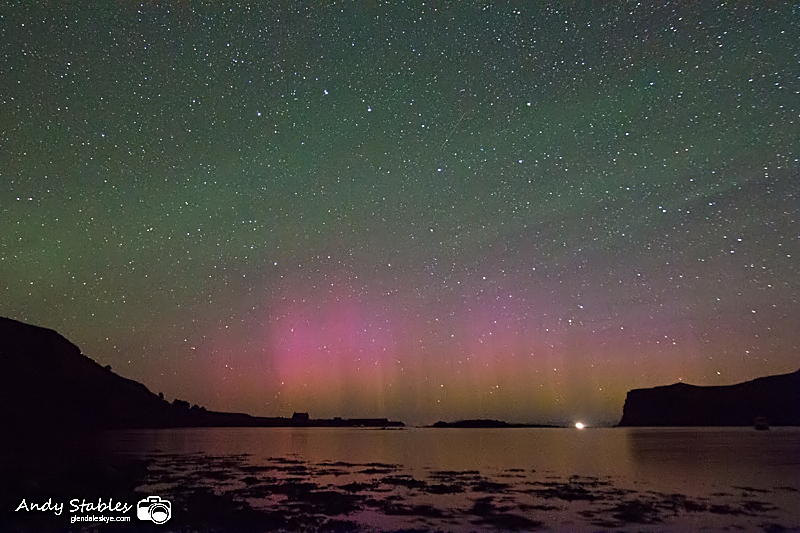 This aurora was photographed as far South as Essex. The aurora was extending almost to the South, which can be seen clearly by the presence of the constellation Orion in the fourth photo. 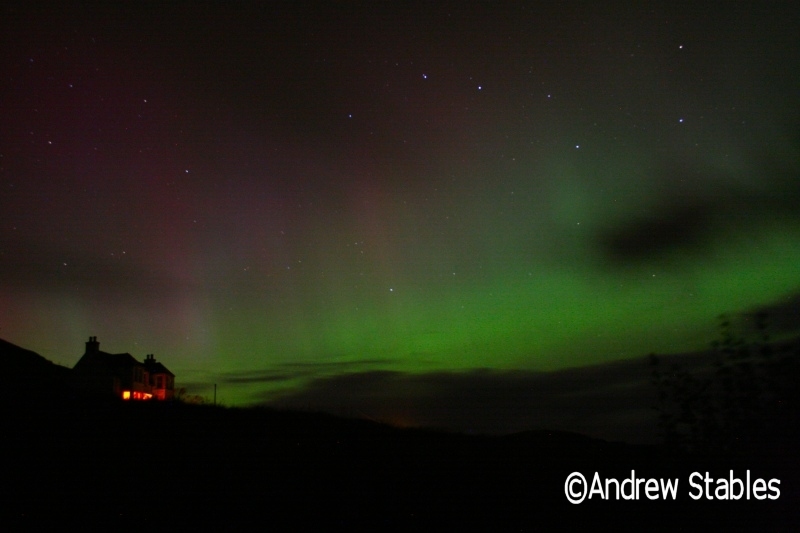 There was a beautiful aurora borealis from 7:15pm onwards. 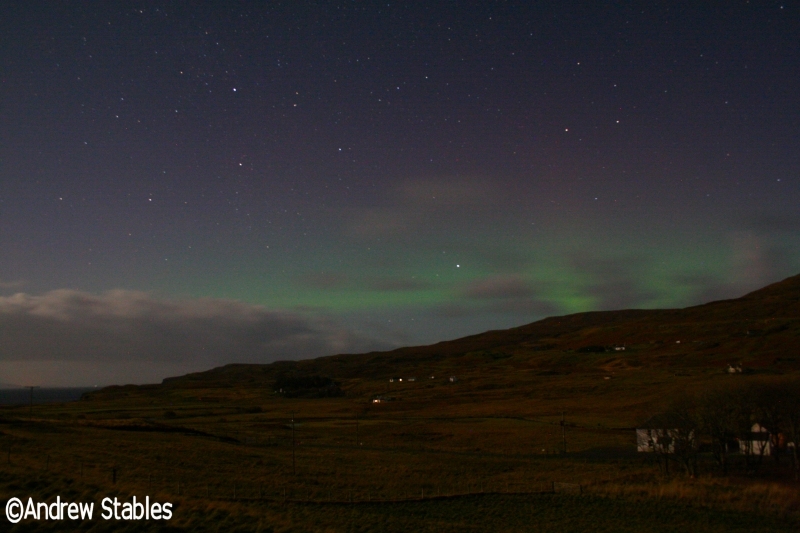 There was an aurora showing from 7:45pm onwards. 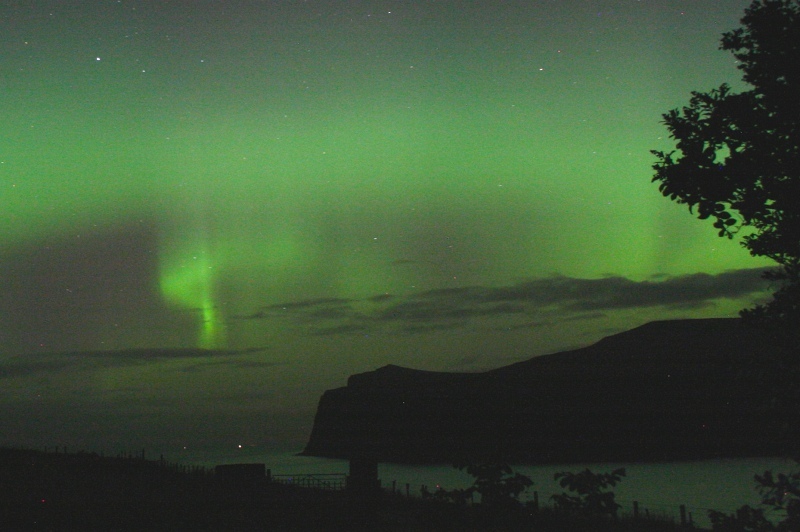 You can now sign up to receive text alerts directly to your mobile phone when there is an aurora here in Glendale by following my twitter feed at : https://twitter.com/SkyeAuroras and enabling SMS notifications. 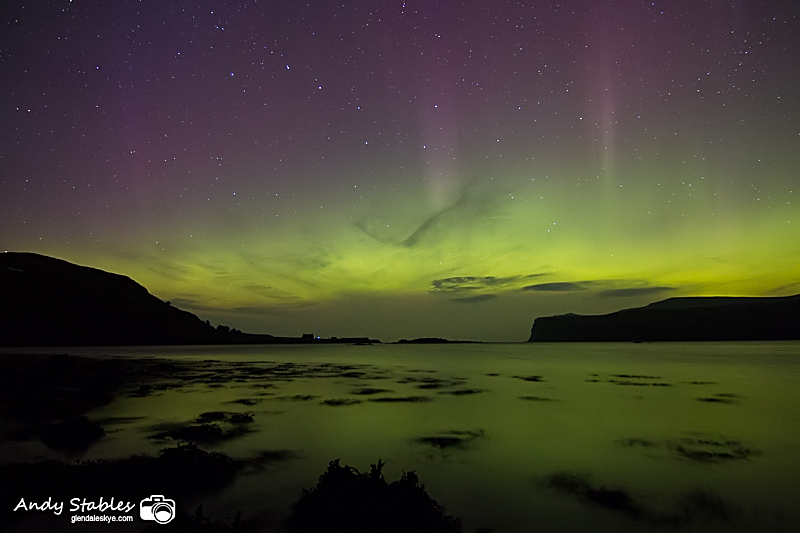 There was a fairly strong aurora borealis from 6:20pm until around midnight, with a peak from around 9:30pm till 10pm, when there were a number of columns and rays. It was visible by eye in white. There was another beautiful aurora borealis that began around 8:15pm and continued throughout the night. 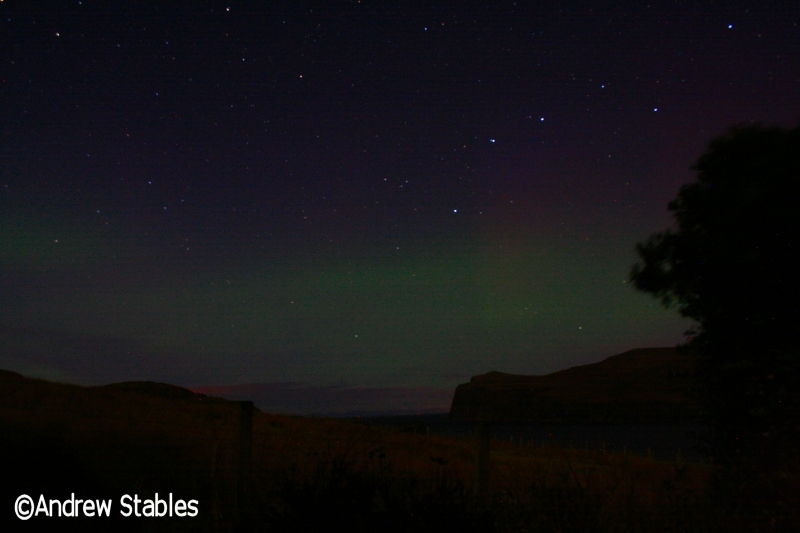 It was particularly bright from 9:30pm until around 10:10pm when it was visible in colour to the naked eye. 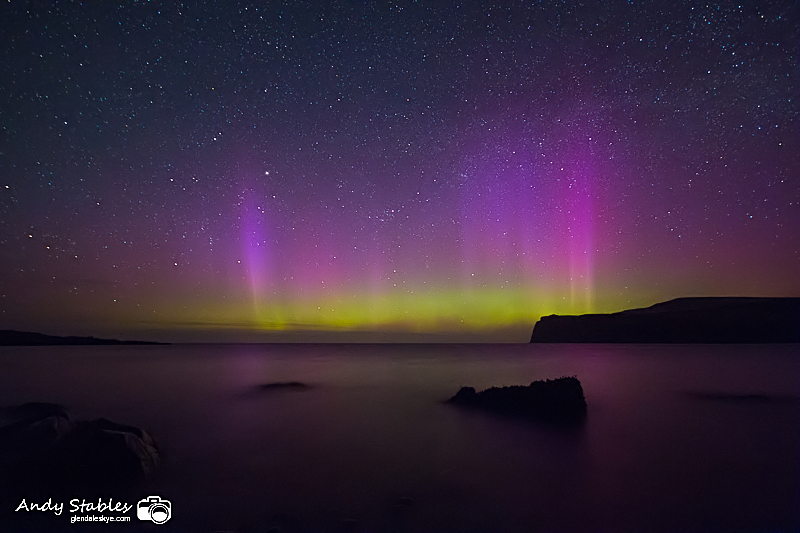 The brightest aurora for decades was experienced tonight in Glendale with an aurora visible in colour by eye in green, purple and red from 9:30pm onwards. 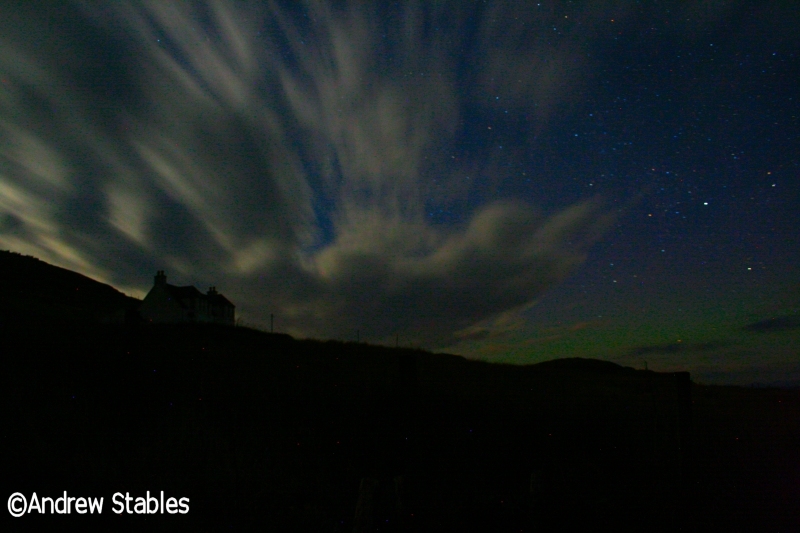 There was a strong aurora borealis being detected on camera and visible by eye in white from 9:40pm onwards, through gaps in the cloud. 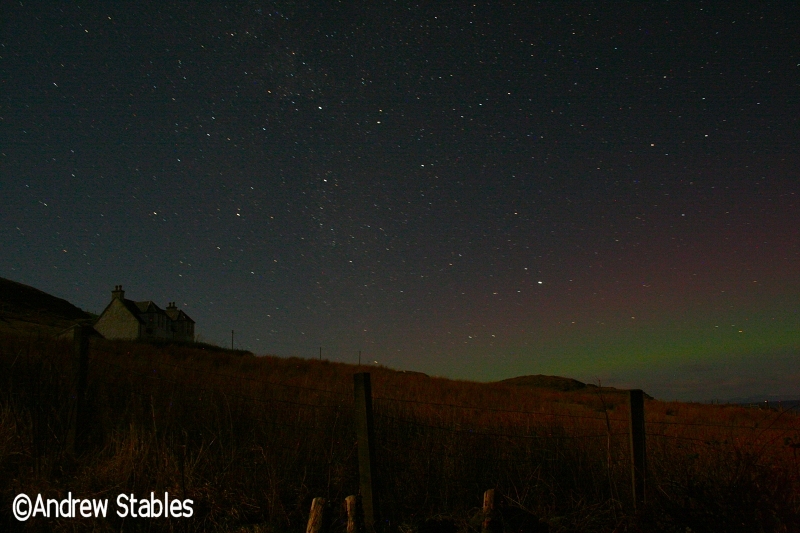 There was a weak aurora borealis being detected on camera at around 10pm. 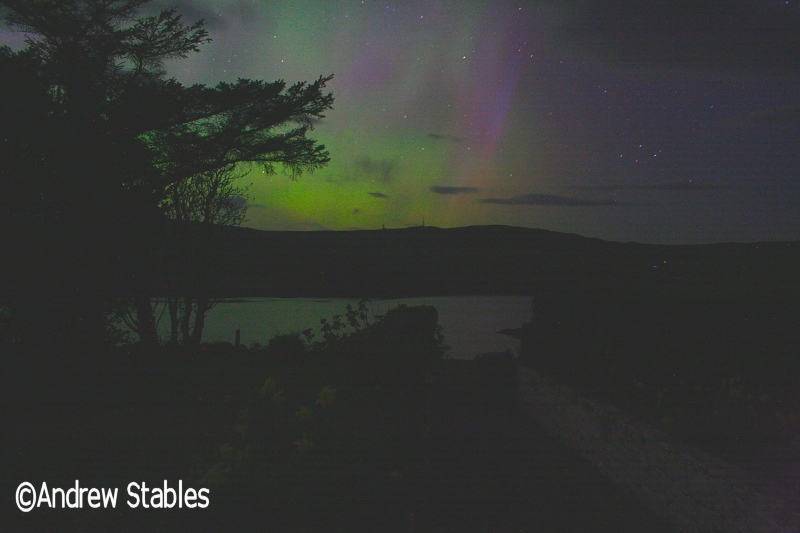 The aurora borealis was being detected on camera tonight from 9:50pm onwards. 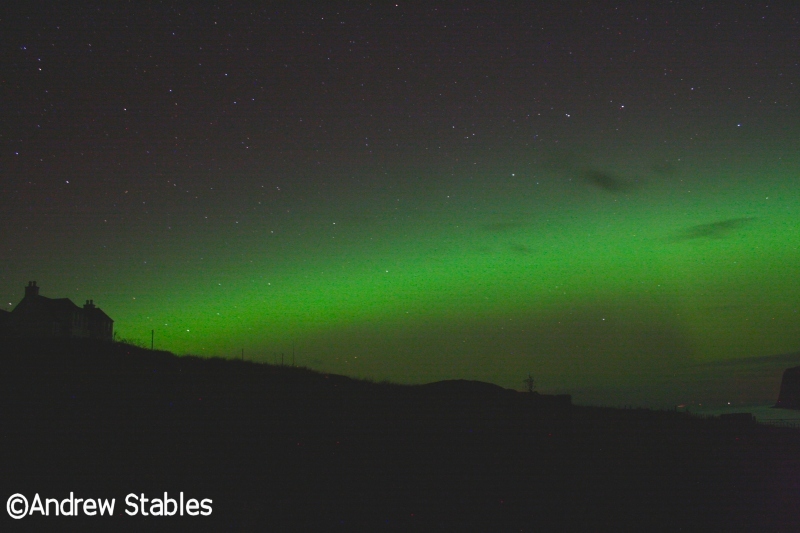 There was a spectacular aurora borealis over Glendale from 10:15pm onwards last night and through into this morning. 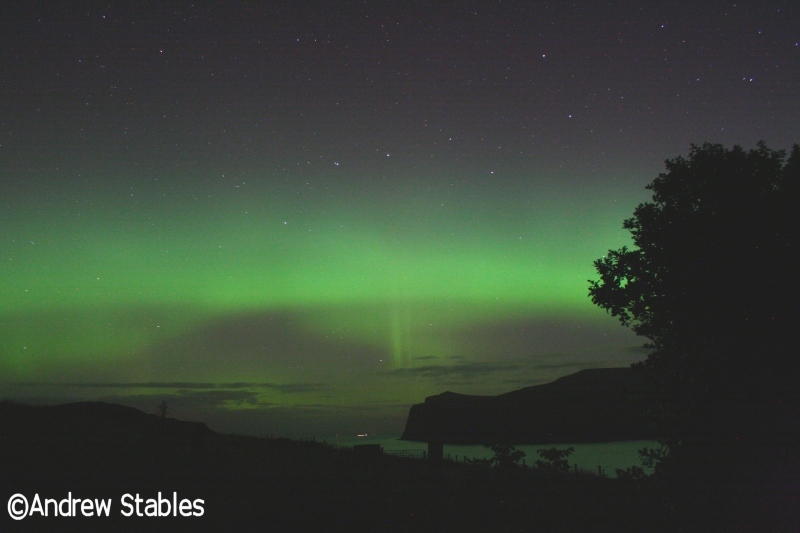 It was greenish white by eye, with spectacular rays and columns particularly towards midnight onwards. 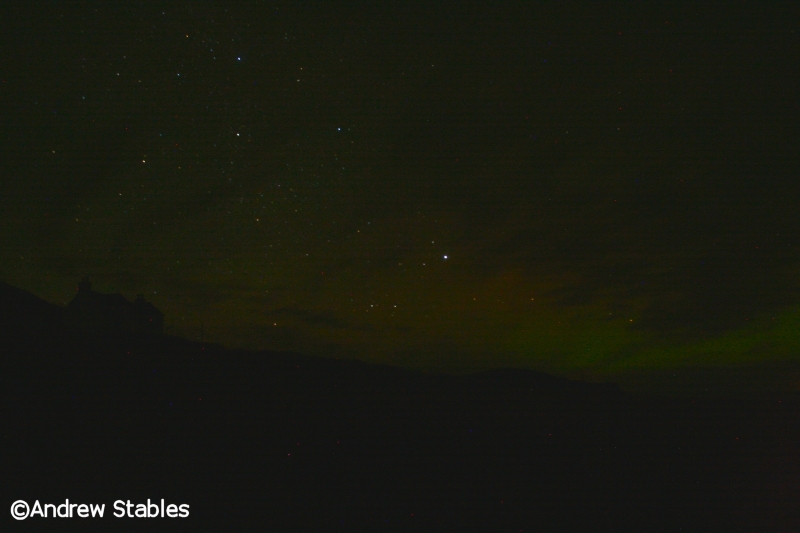 There was a weak aurora borealis being detected on camera, low to the horizon, at 00:30 hours (our 2nd aurora of the season) and also a faint moonbow. 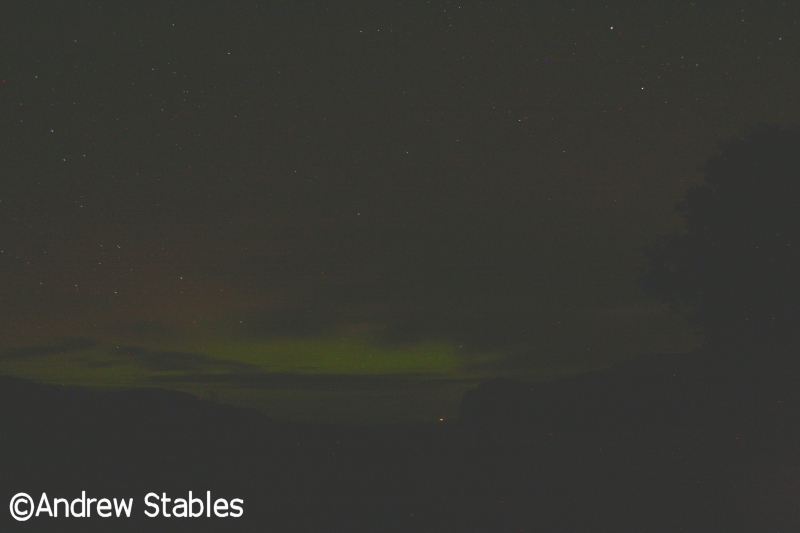 There was a glimpse of the aurora borealis in the skies over Glendale in the early hours of this morning. The earliest ever start to the aurora-watching season here in Glendale. 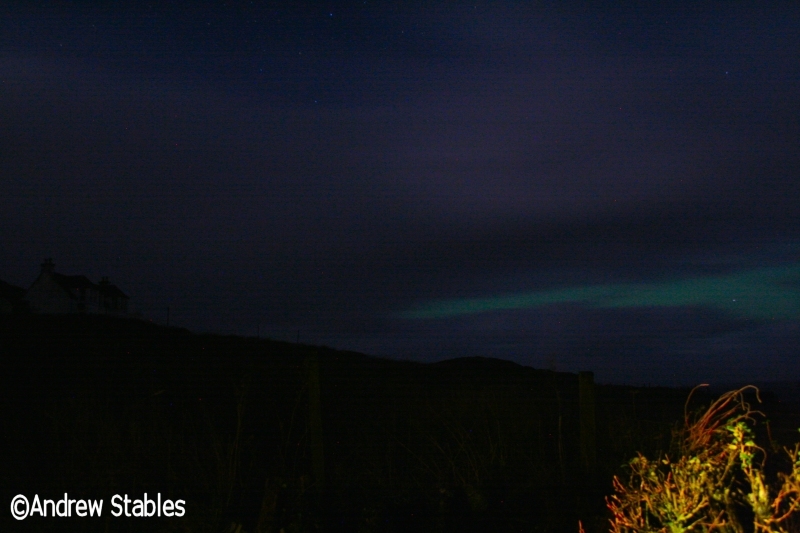 The aurora was picking up on camera around midnight. Not visible by eye. The Kp was 2. 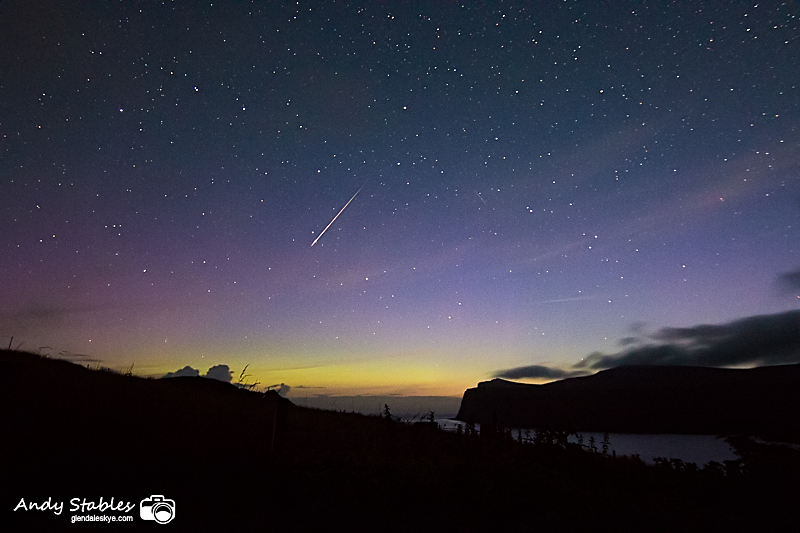 The comet 'Pan Starrs' can be seen just at the edge of the auroral arc. The Mull Magnetometer hit K4 at around 7:30pm. 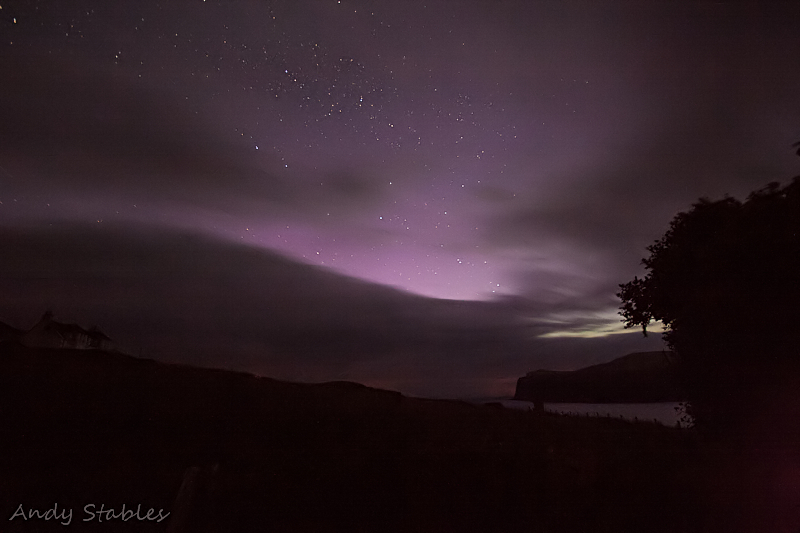 The activity triggered a purple and green aurora that was picking up on camera from around 9:15pm. 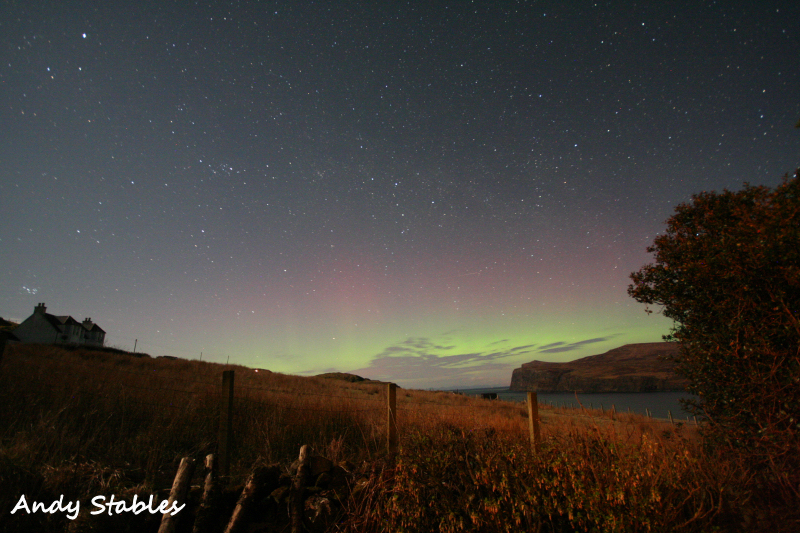 Invisible by eye unless you've had practice at viewing coloured auroras. Faded considerably by 10:30pm. 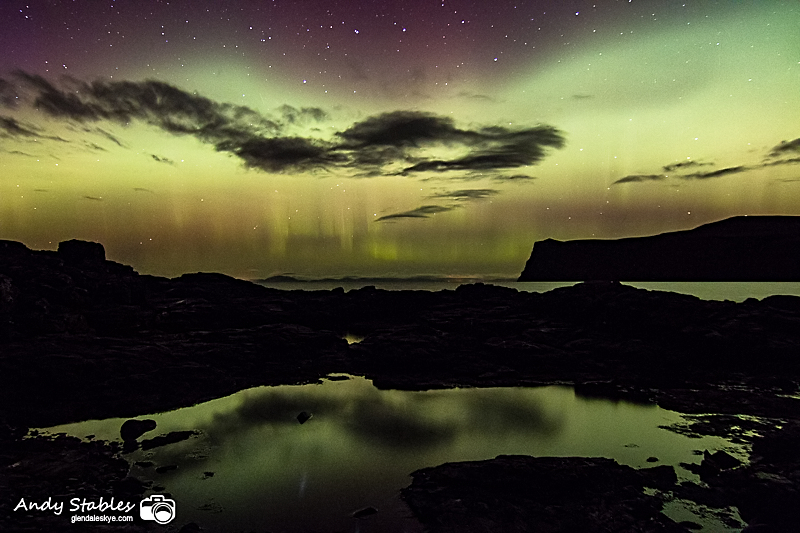 A geomagnetic storm had been raging on and off throughout the day, which was spectacularly clear and sunny on Skye until nightfall, when a big lump of black cloud sat out North. The Kp went up to 5 on a number of occasions but was at 4 when these were taken. Interestingly, for those folks who slavishly follow the Bz plots, the Bz was North throughout the period when these photos were taken. 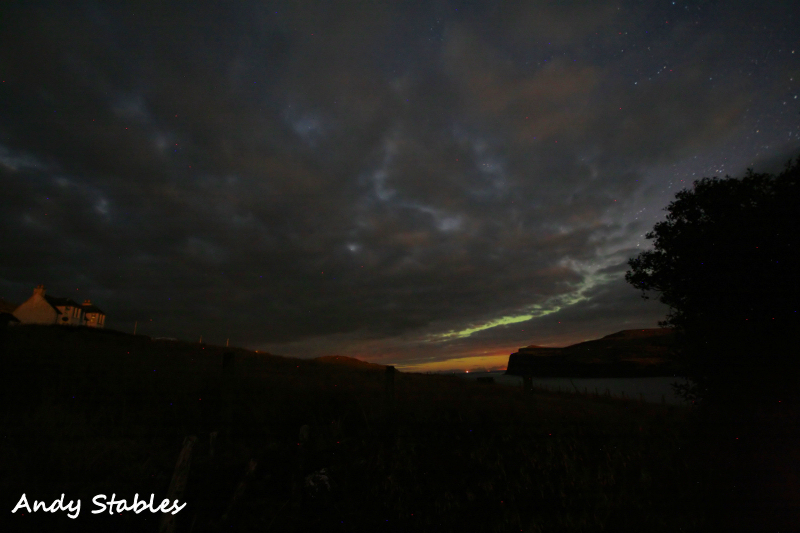 It was a race against time to catch a few glimpses of the aurora through chinks in the cloud before the moon came up and washed it away. 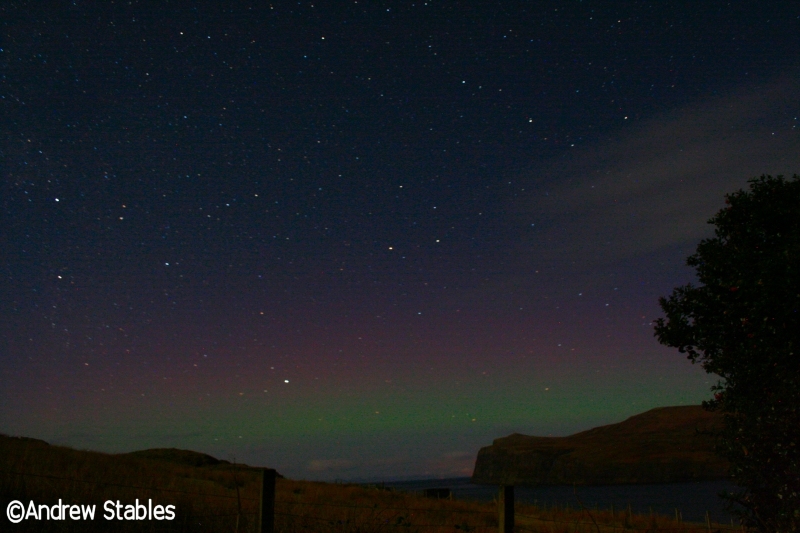 The aurora was extremely weak and colours were being washed out by the virtually full moon. It was actually clearly visible to the naked eye. The Kp was 4. First picking up on camera at 9pm. Very variable intensity from invisible to the eye to glowing pale green to the eye. Very good by eye at 11:20pm. Kp 2 to 3. The Kp went on to peak at 4 between midnight and 3 am. 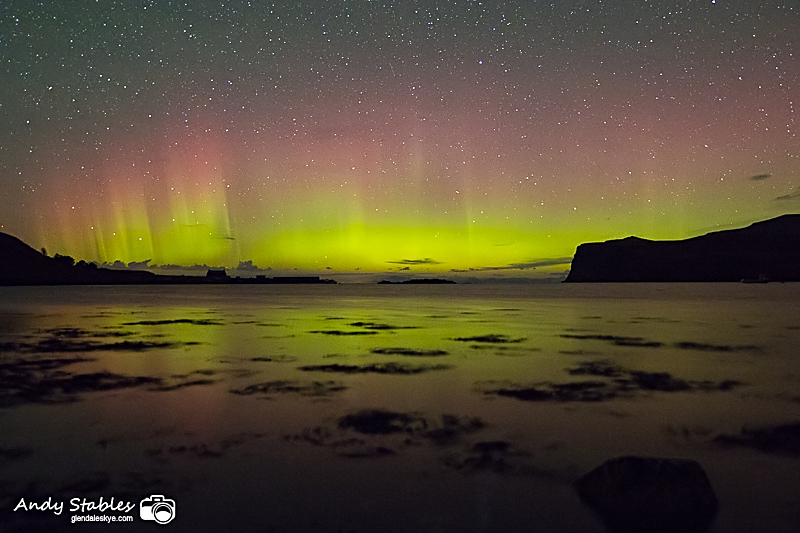 A beautiful, bright aurora was visible to the naked eye from 8pm until 11:30pm. The Kp had been hovering between 5 and 6 all day and actually reached Kp 7 during the evening. Taken using a 30s exposure at F4.0, ISO 1600. A weak aurora was just discernable to the eye from 11pm and coming up green on camera, later intensifying to include purples. 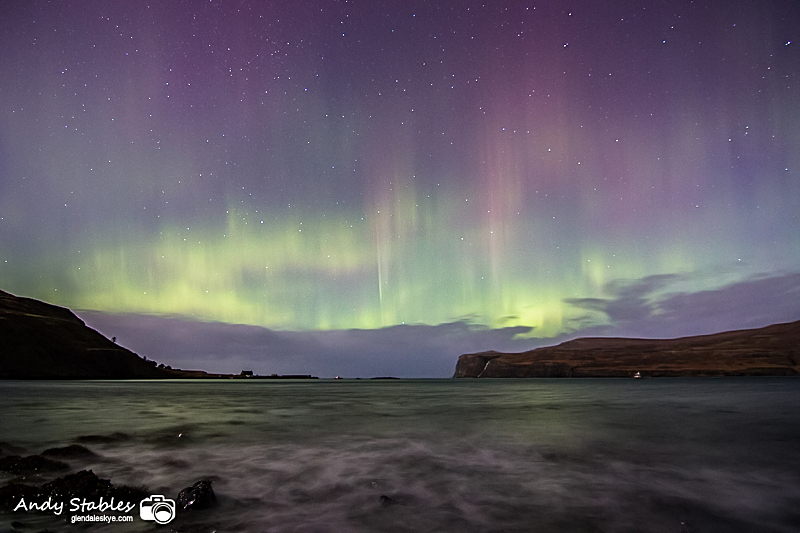 The Kp was 1 and no aurora was expected or had been forecast. Taken using a 60s exposure at F5.6, ISO 1600. 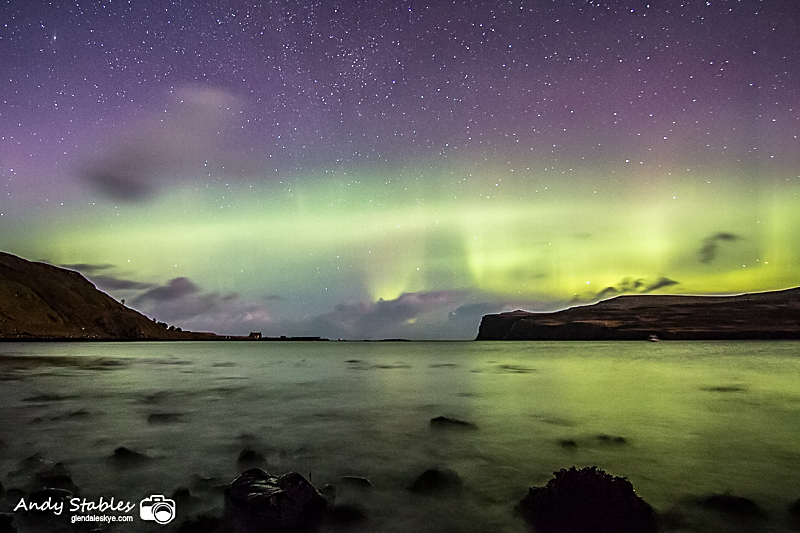 The Kp had been hovering between 4 and 5 all day due to a powerful CH HSS but the aurora did not become visible till 11pm, at which time it was glowing white to the eye. 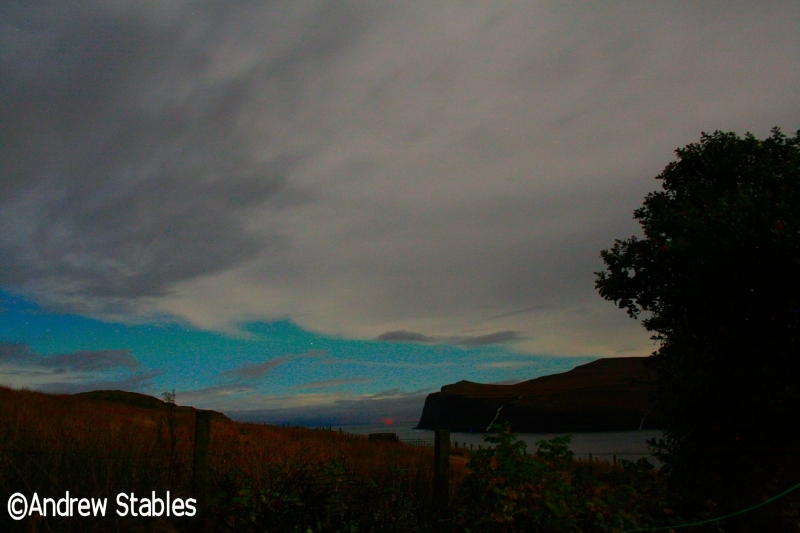 We were hampered by heavy cloud and peering through tiny gaps. Taken using a 60s exposure at F5.6, ISO 1600. 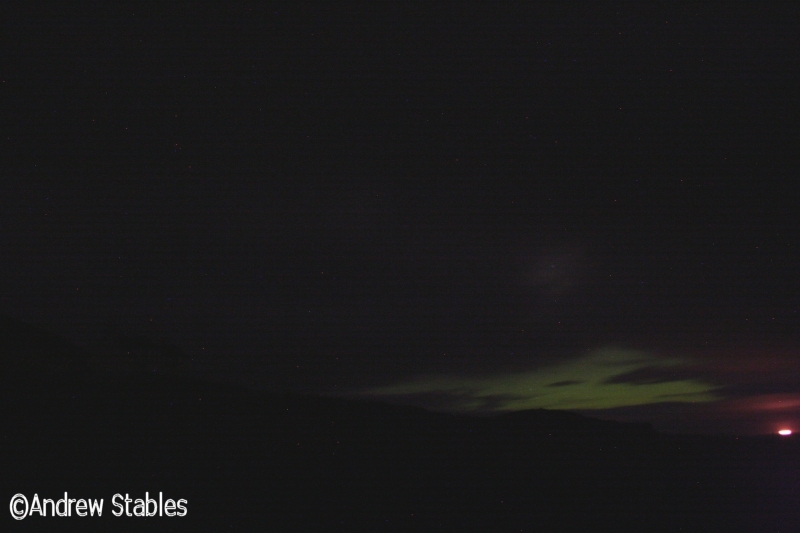 Another weak aurora being detected on camera from around 7:50pm and just discernable to the eye by 8:40pm. The show was over by 10pm. Taken using a 60s exposure at F5.6, ISO 1600. Kp was 3. 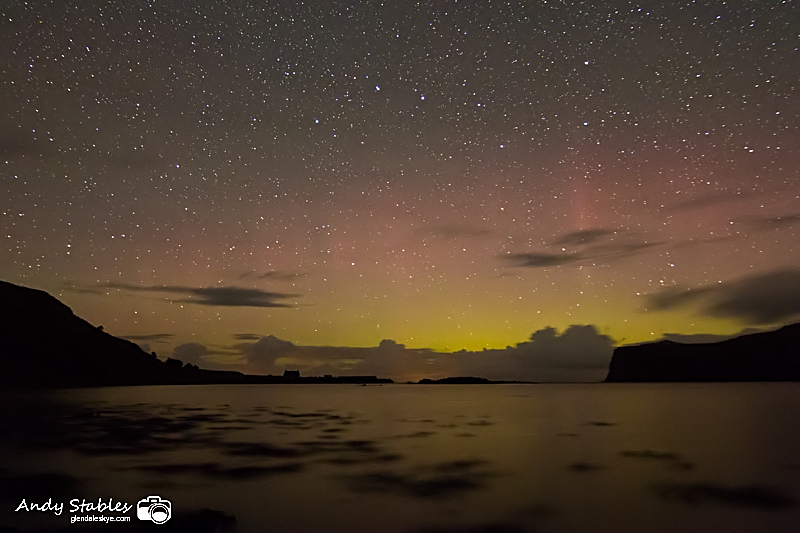 A disappointing aurora, as it had been forecast to be as intense as the aurora of the 17th/18th. It was very low and weak. 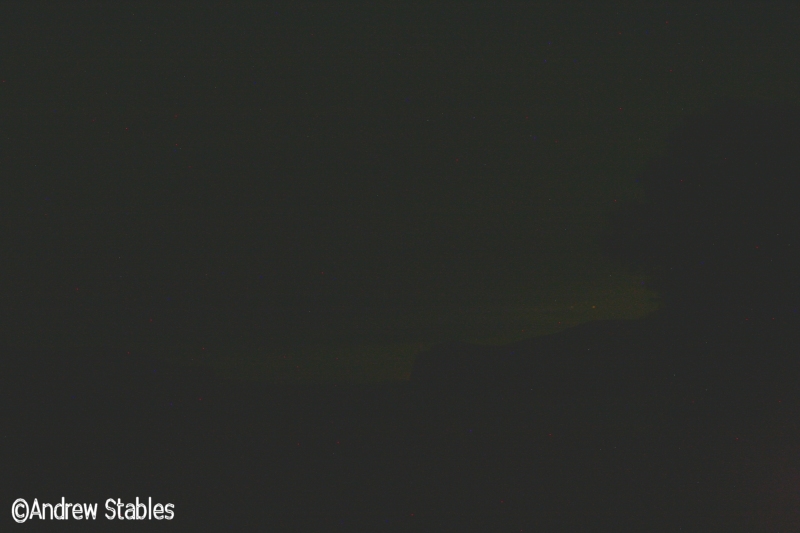 It was first detectable on camera at around 9pm and only became visible to the eye for a short period around 11:10pm. Taken	using a 60s exposure at F5.6, ISO 1600. 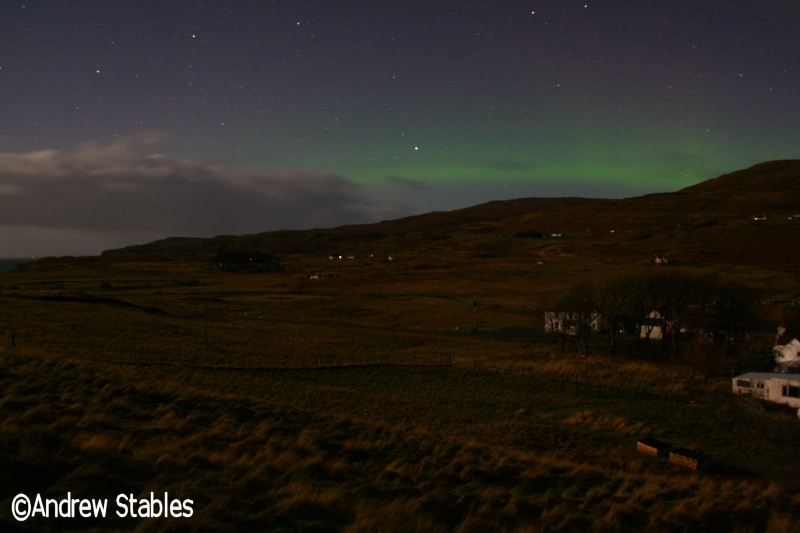 The aurorawatch status was green at 1050H. There was a very weak aurora being detected on camera from 8pm onwards. The aurorawatch status was green at 1000H. Kp was 2. These photos were taken using a 60s exposure at F5.6, ISO 1600. 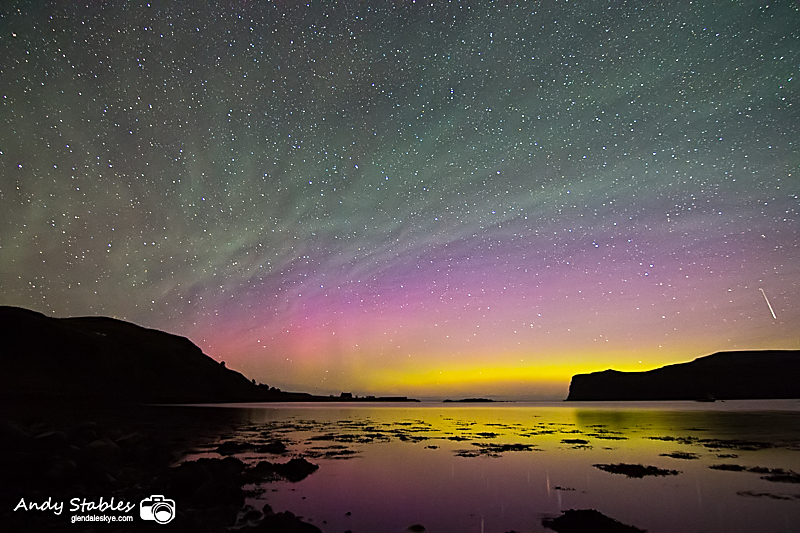 This was one of the most intense auroras in decades but was only short-lived. It began even before the sun had properly gone down and peaked at around 6:35pm. 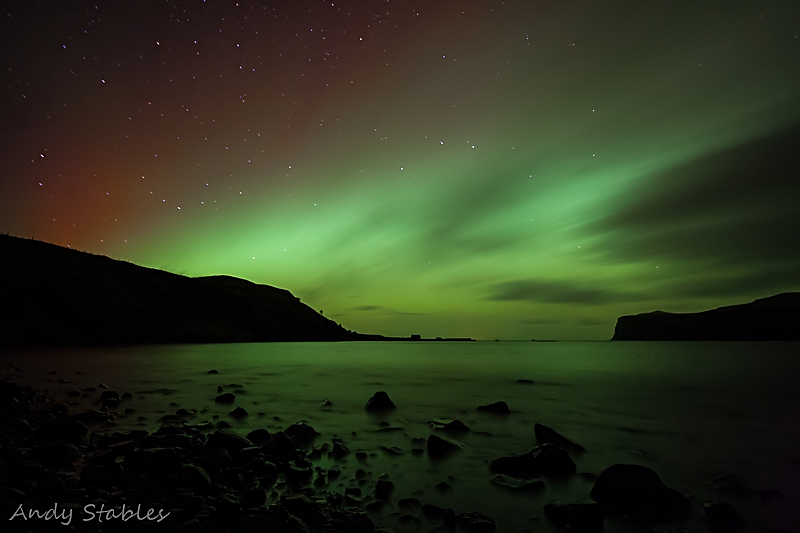 The greens were vivid green to the naked eye, which is extremely unusual for auroras on Skye. It was an extremely windy night, hence the tree looking a little blurry because it was swaying so much. The Kp was 4 and the aurorawatch status was yellow. 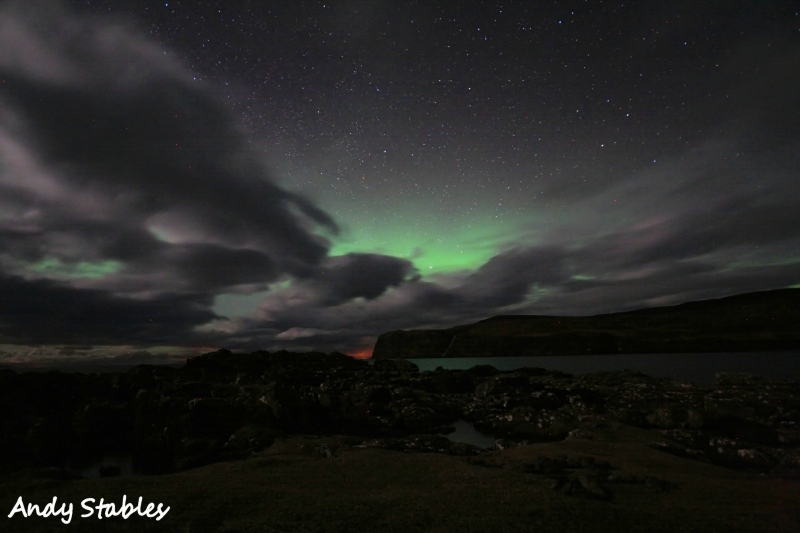 The first fairly bright aurora of 2013 was visible from 8:40pm until around 9:30pm, as ever we were hampered by cloud to the North. 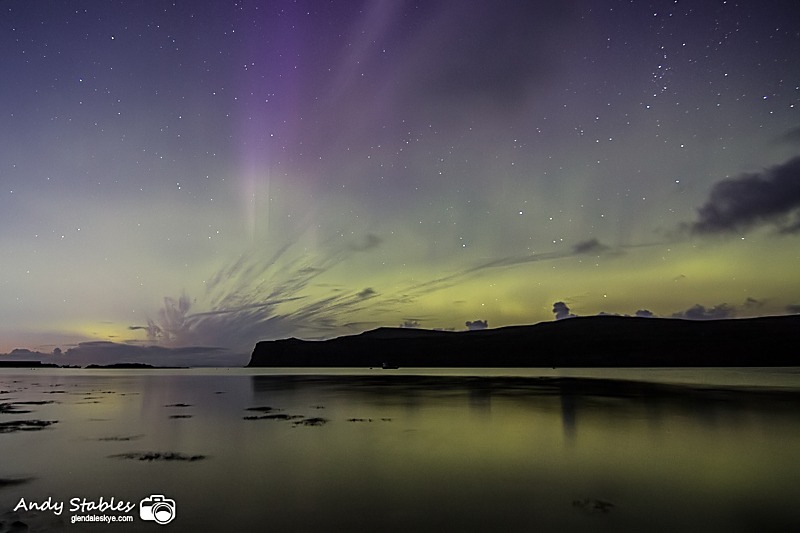 Small columns could just be seen with the eye over Dunvegan Head. The colours were predominantly green and orange. The Kp was 2 and the aurorawatch status green at 500H. 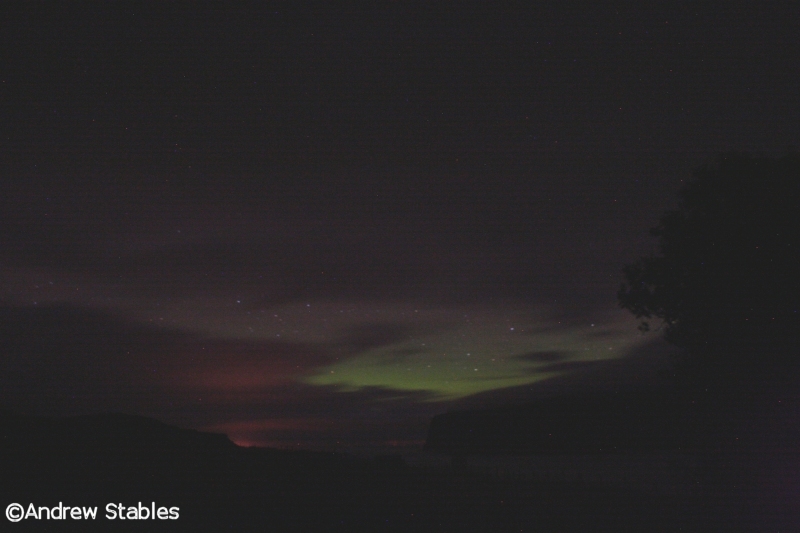 An extremely weak aurora borealis was just glimpsed beneath the cloud at 11:35pm. 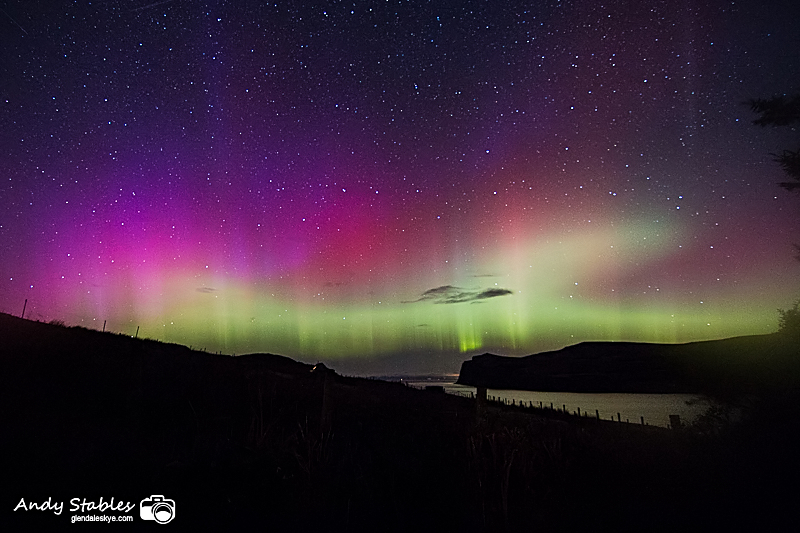 The aurora was caused by a slightly elevated solar wind from a Coronal Hole High Speed Stream. Lower Milovaig. January 8th, 2013. This was one of the weaker auroras that we've experienced this winter and only just visible to the naked eye, being very low to the horizon. 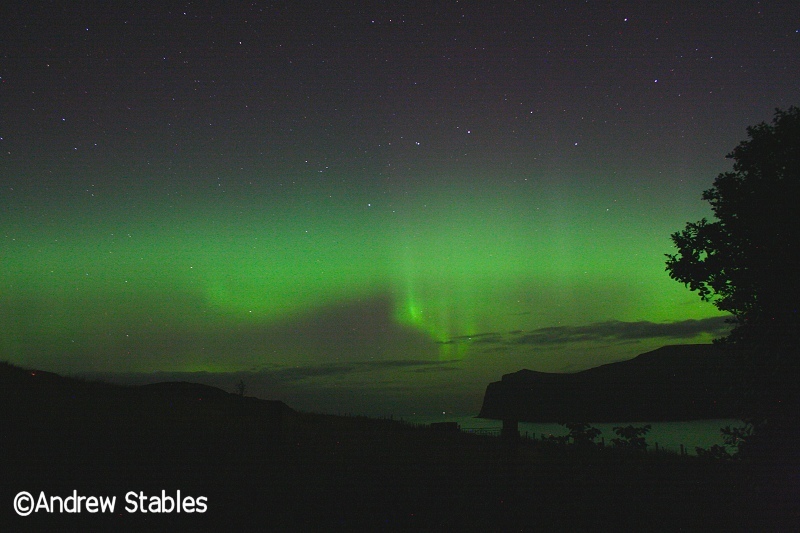 The greens started to intensify after midnight. 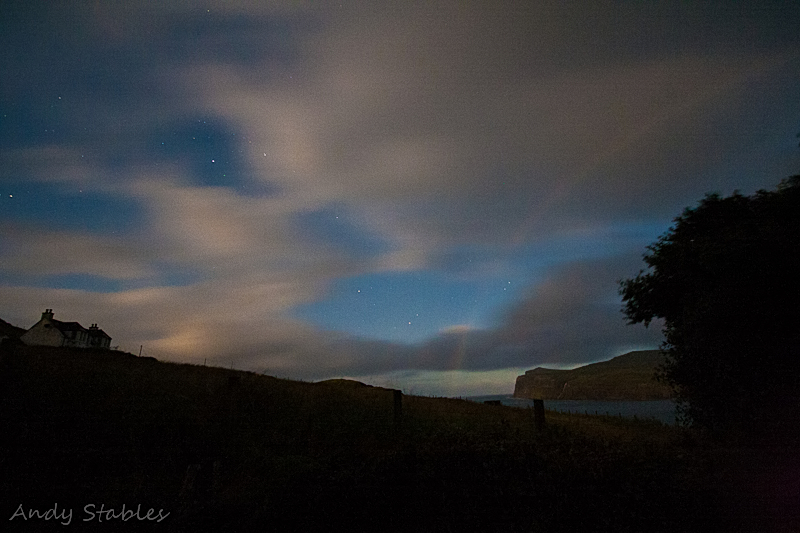 This photograph was taken at 11:50pm in Lower Milovaig. It was an extremely weak aurora, just visible to the naked eye and the camera was barely capturing a faint green wash to the night sky. 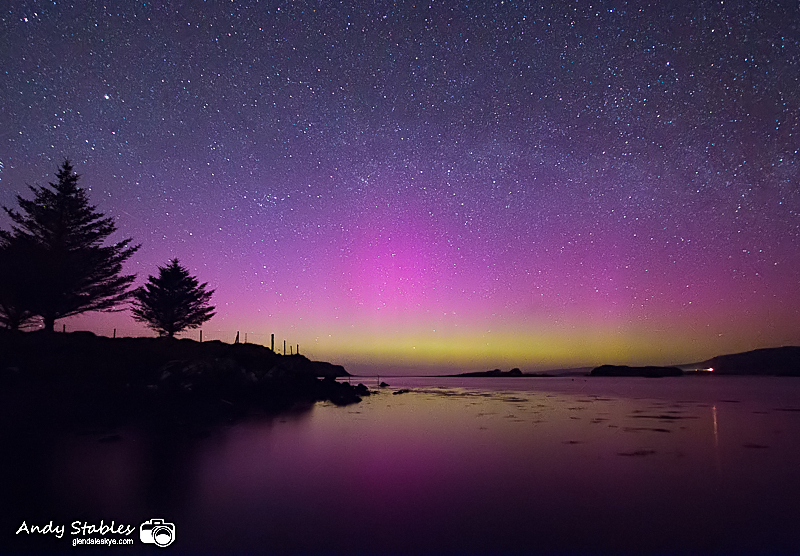 The aurora was caused by a minor CME impact from a solar filament eruption on Dec 5th. 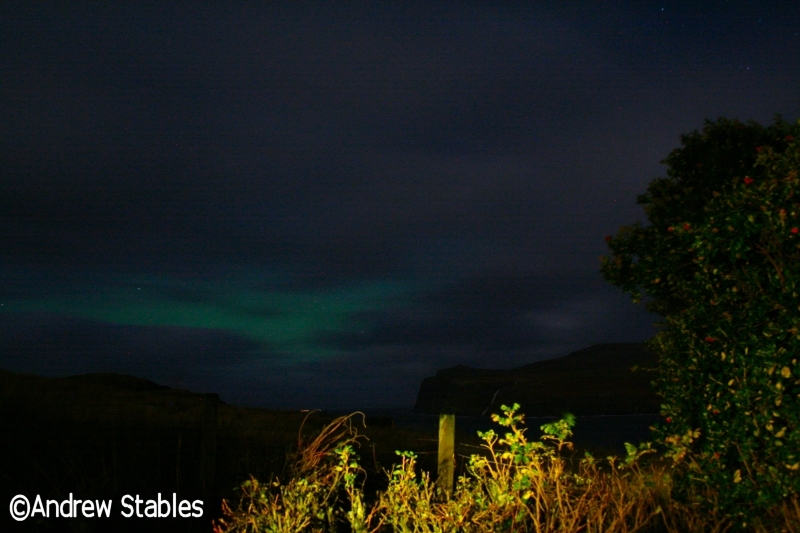 The Kp was 1 and the aurorawatch status was green around 850H. These photos were taken between 1:00am and 1:30am at Lephin, Glendale, Isle of Skye. 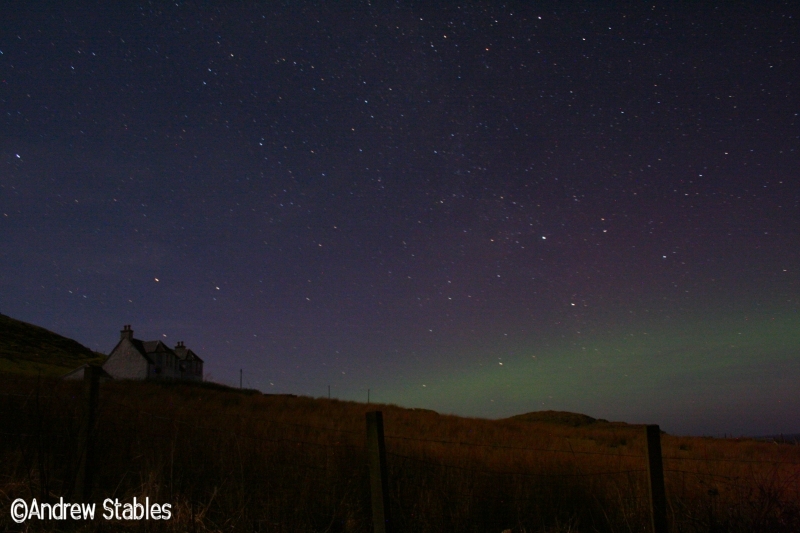 They show the village church, shop and Lephin Cottage under the aurora borealis. The Kp was 4 and the aurorawatch status was green below 800H. 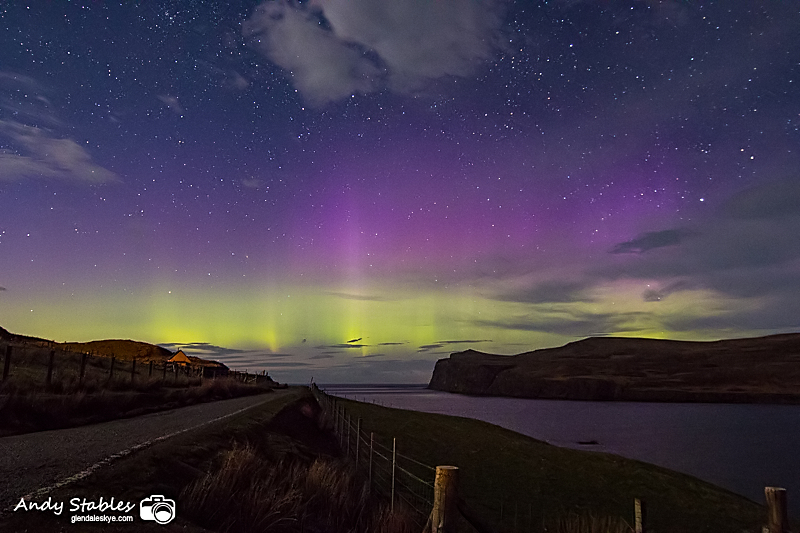 This aurora was caused by a high speed solar wind. 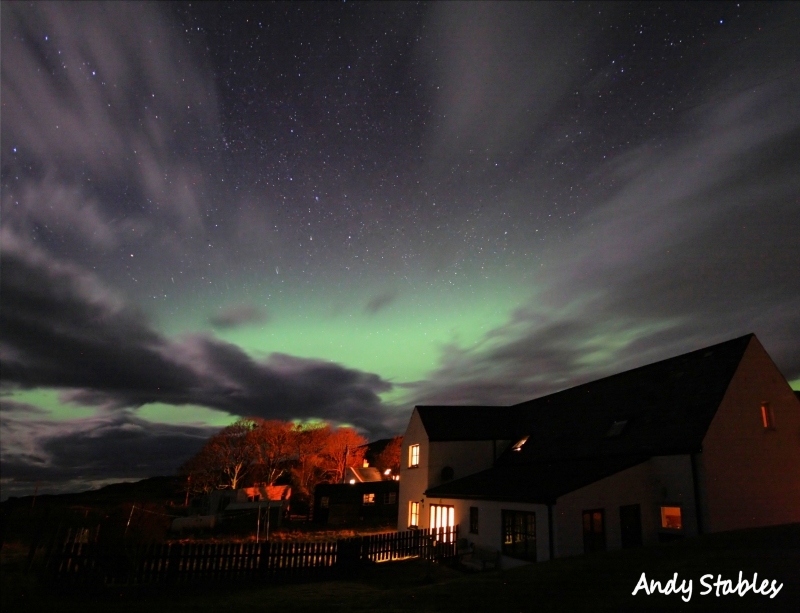 It reached Kp 4 and aurorawatch 'yellow' status between 7pm and 10pm.We were mired in thick cloud and extremely heavy showers of rain, sleet and hail. 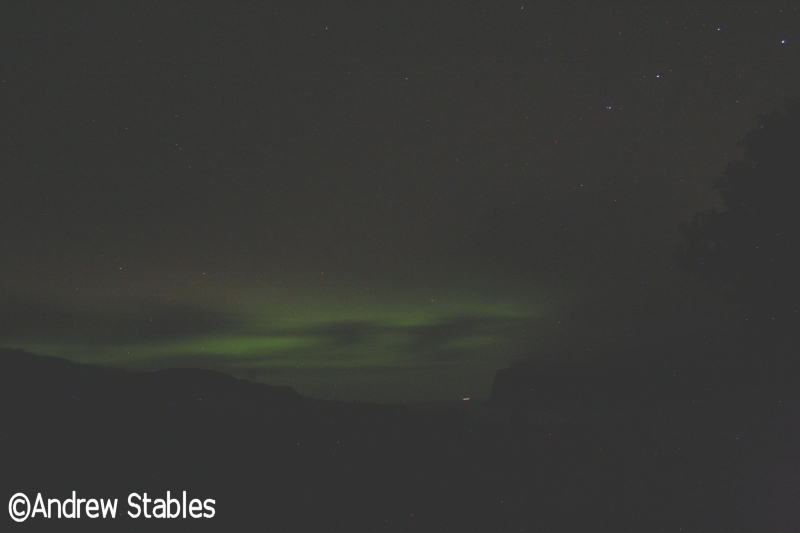 We were just getting tiny glimpses of the aurora through gaps in the cloud. 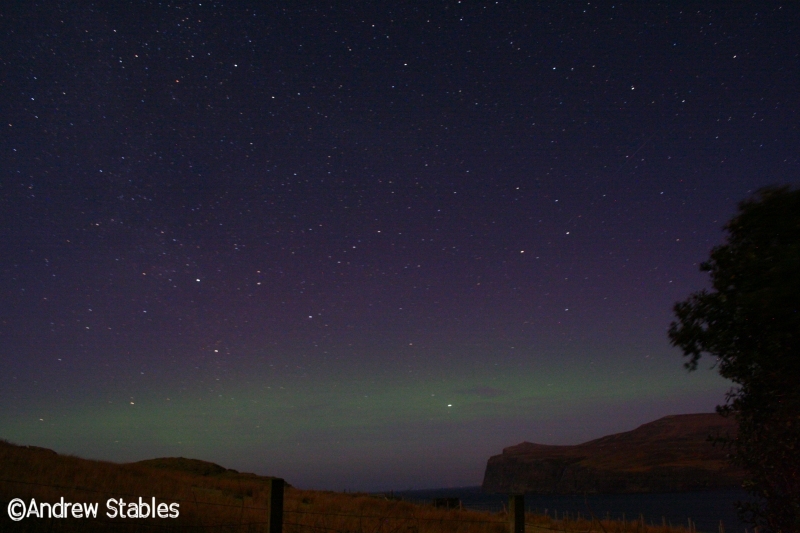 This was a totally unexpected aurora, as there were no indications that an aurora would be visible this evening. 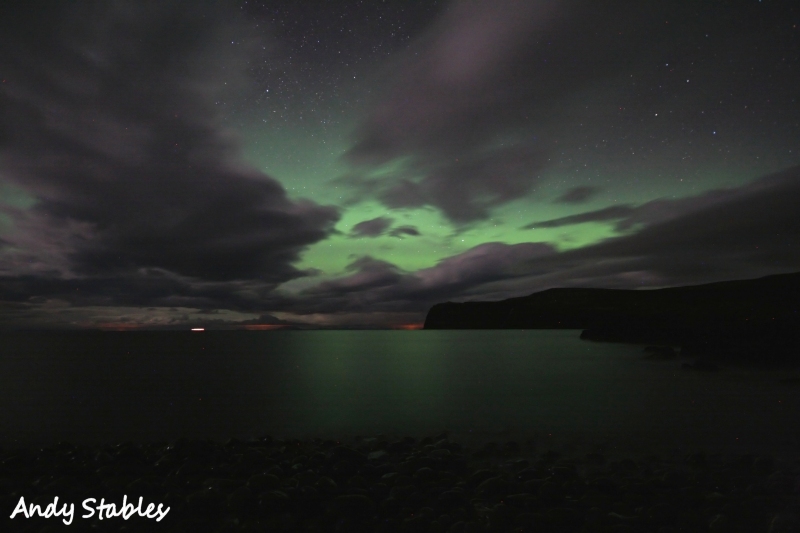 The photos were taken between 11:20pm and 11:25pm, when the sky was glowing brightly to the naked eye but, unusually, the aurora was very muted on the camera. 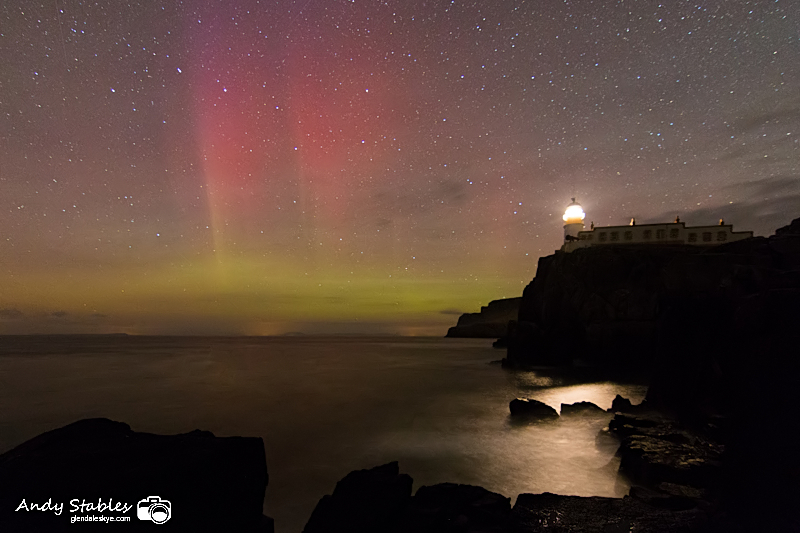 The aurora borealis was just visible between 7pm and 7:30pm this evening, as we caught the tail-end of a strong geomagnetic storm that hit the earth at 3am this morning. This was the third consecutive night that the aurora had been visible in Glendale. For the second night in a row the aurora borealis was visible over Glendale. It began penetrating the cloud at around 9:30pm and was quite vivid between 9:45pm and 10pm before being blotted out again by heavy cloud. 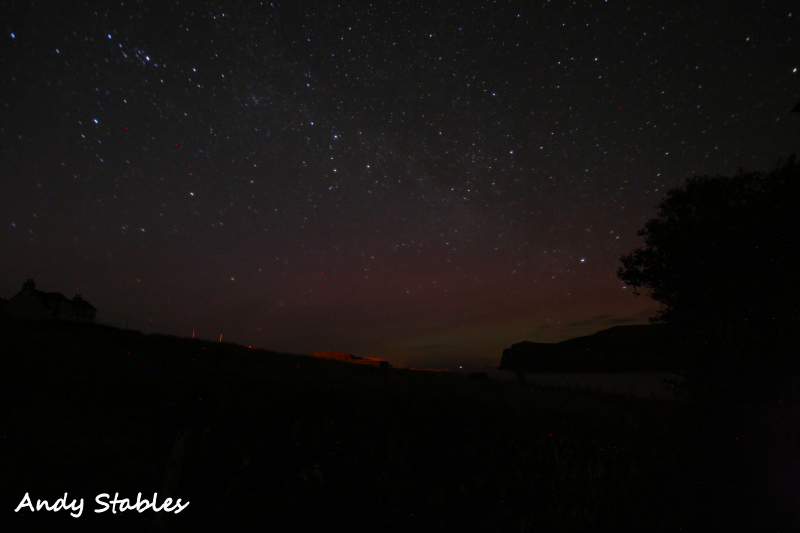 Skies cleared again at 11pm and treated us to a beautiful aurora that was over 50% orange, so looked very faint to the naked eye but was good on camera (photo #3). A weak aurora borealis was visible over Glendale from around 10pm onwards. 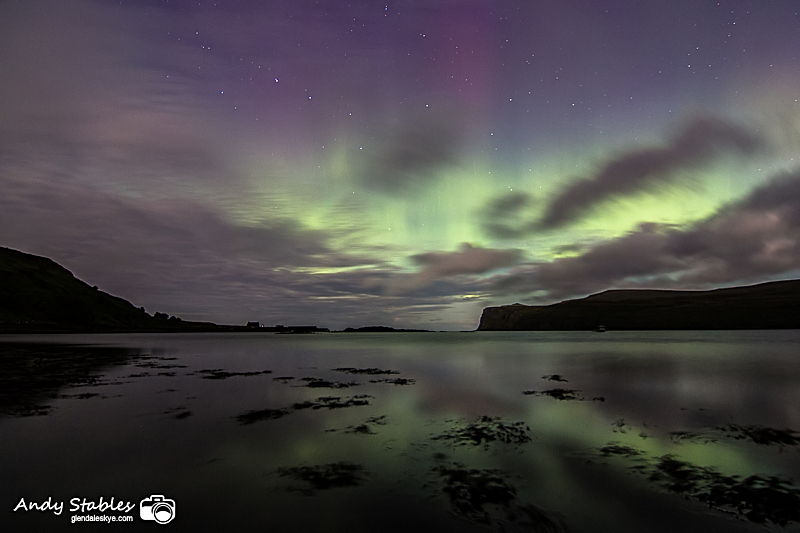 This is our fifth aurora in the last five weeks and had been forecast for a couple of days. 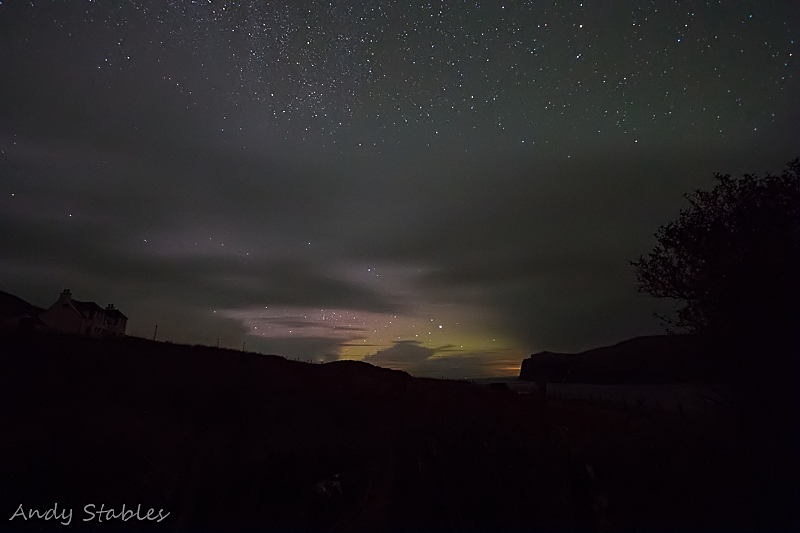 We were hampered by cloud to the North but the aurora was bright enough to penetrate thinner cloud, as seen in photo #3 taken at 11:30pm. The light intensity was very erratic ranging from bright, to barely visible, within a matter of seconds. 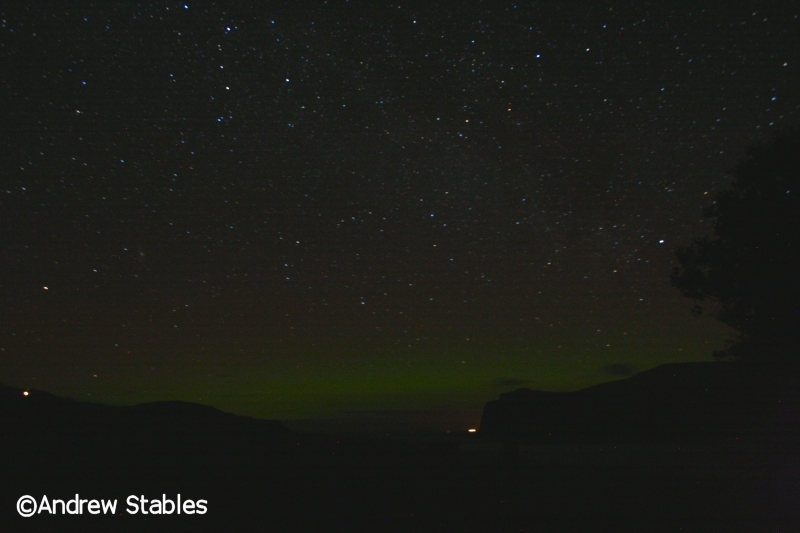 The aurora borealis was very faintly visible from 11:15pm onwards. It can just be seen as a faint green arc running across the right of the photos. The aurora was caused by a geomagnetic storm that had started in the afternoon but unfortunately coincided with some awful wet, cloudy skies in Glendale. 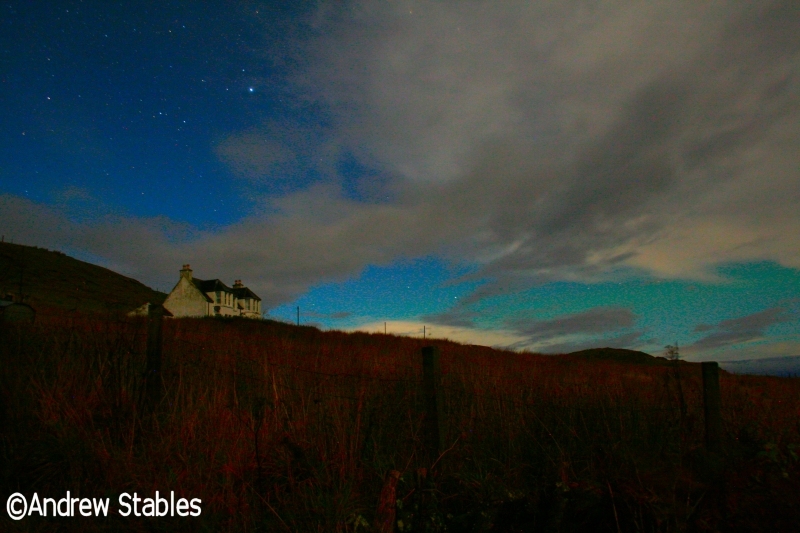 The aurora was fading by the time the skies cleared and the near-full moon washed away much of the colour. 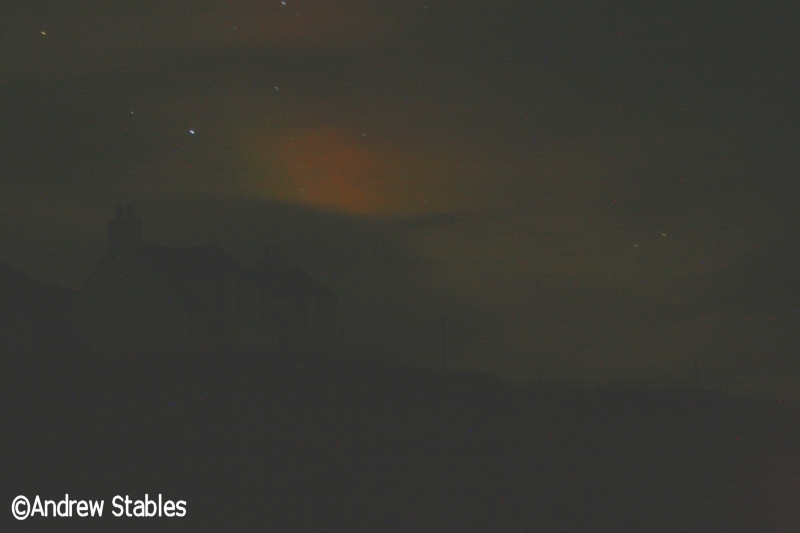 A very faint aurora showing extensive oranges and greens. 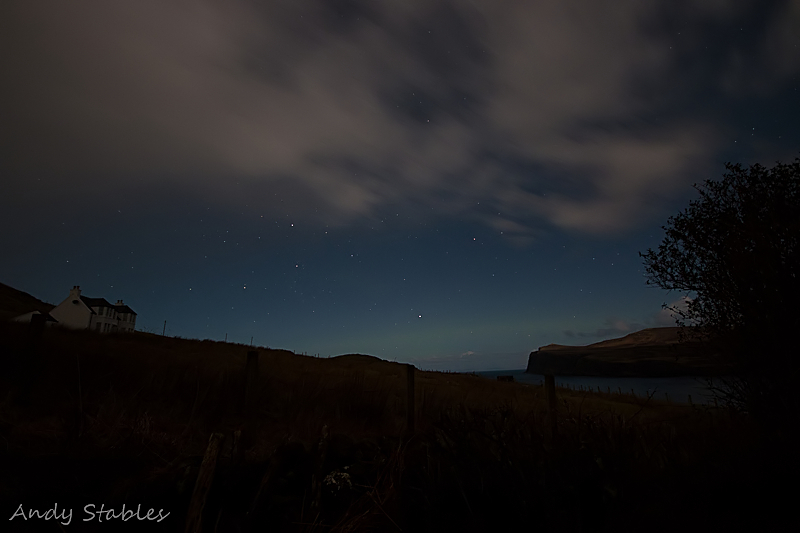 A weak aurora borealis was visible to the naked eye again in the early hours of the morning and coming up green on the camera but we were hampered by cloud out to the North. 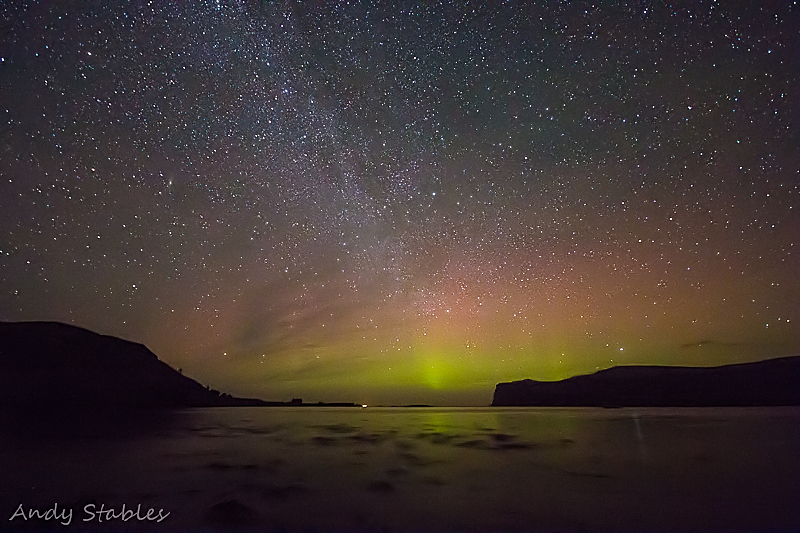 There were some intense orange flares a few degrees above the horizon, which are just visible in this photo. 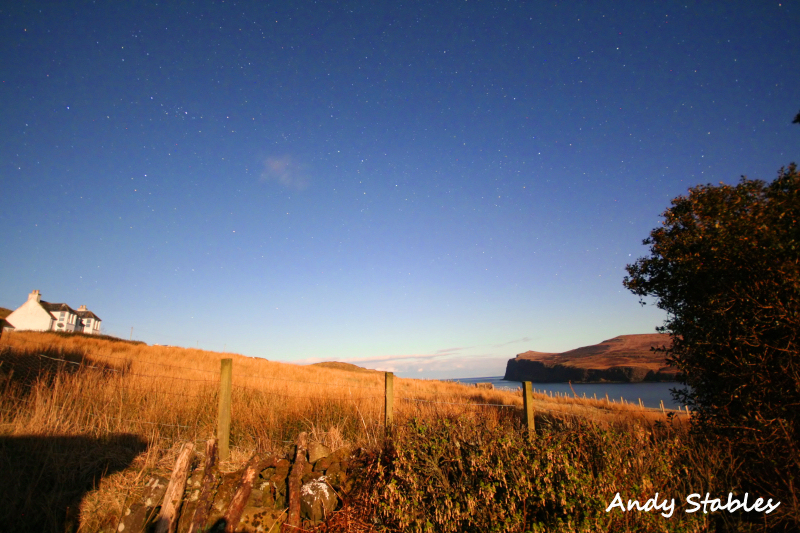 Also, just captured in the photo is a faint orange patch above Dunvegan Head. This was only a minor geo-magnetic storm over Glendale and activity had faded significantly by 01:00 hours. The aurora borealis was visible, but again very weak, over Glendale from 10:15pm onwards. The Aurorawatch status was showing 'yellow'. The camera was capturing some bright orange patches, together with greens. Aurora watchers around the world, like ourselves in Glendale, were seeing extraordinary colours and pulses the like of which have never been seen before. 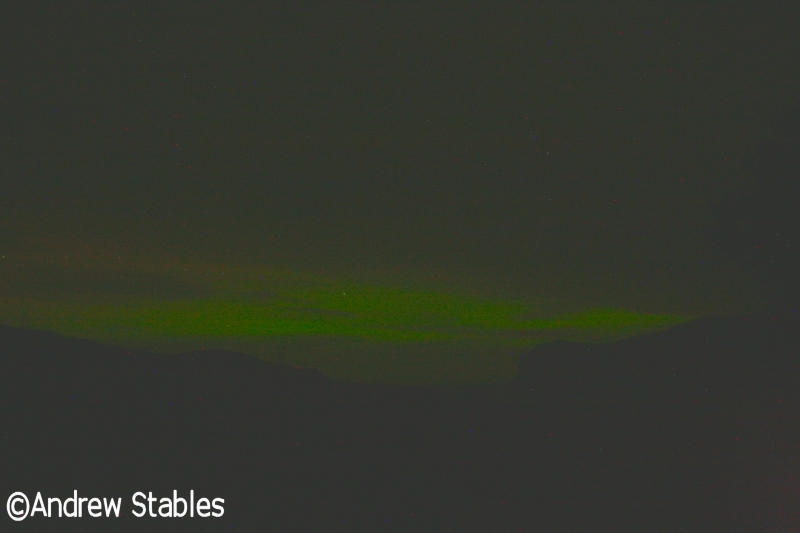 The aurora borealis was visible again over Glendale, although much fainter than on Monday/Tuesday. 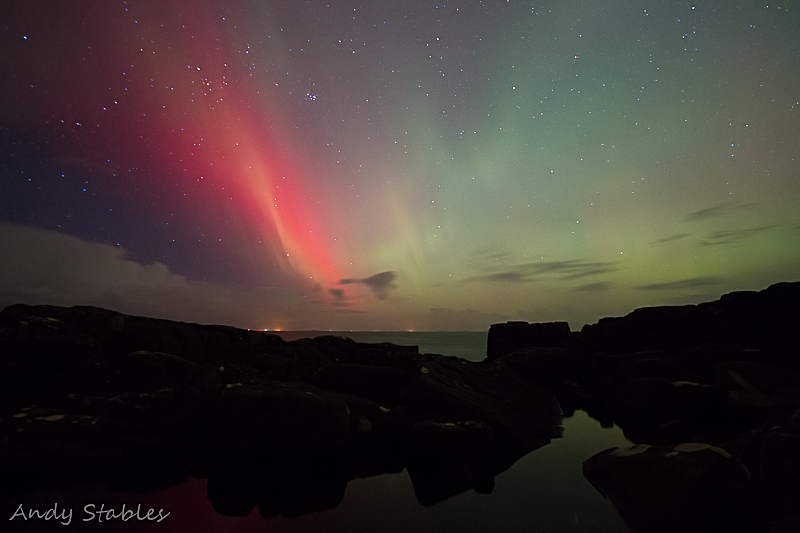 There were a few bright flares and the occasional column. Intriguingly, the camera was capturing the colours as predominantly red, orange and purple, rather than green like in the earlier show this week. The photo illustrates just how much fainter the light intensity is but the flares and columns could be seen with the naked eye. The lights were visible between 10:45pm and midnight. 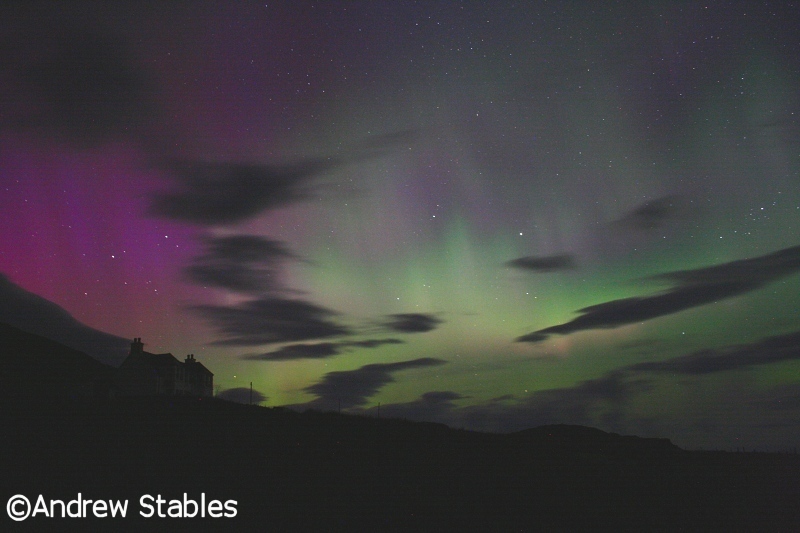 There was a fantastic display of the aurora borealis in the early hours of this morning with a peak of light intensity at around 1am. 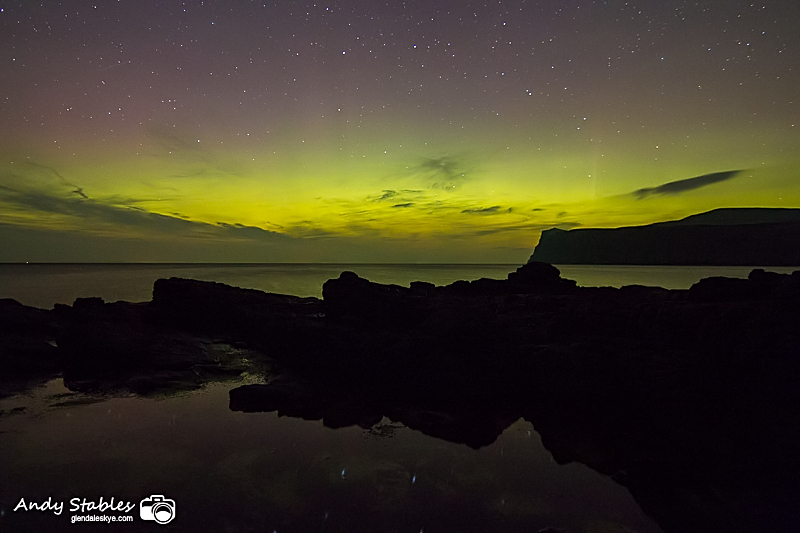 Between 1:45am and 2:30am there was spectacular activity, although the light intensity was lower, with waves of light blazing across the sky. 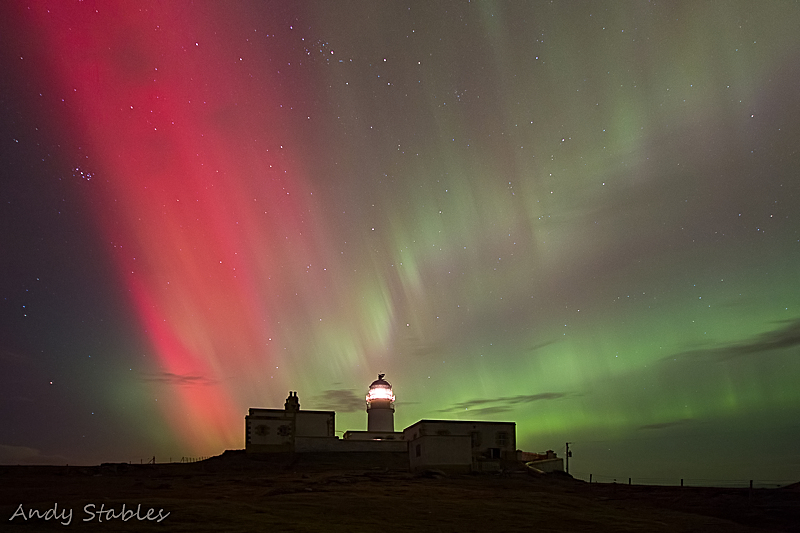 The electromagnetic storm rose to 'red' status on aurorawatch between midnight and 2am before dropping back to high amber status until 3am. 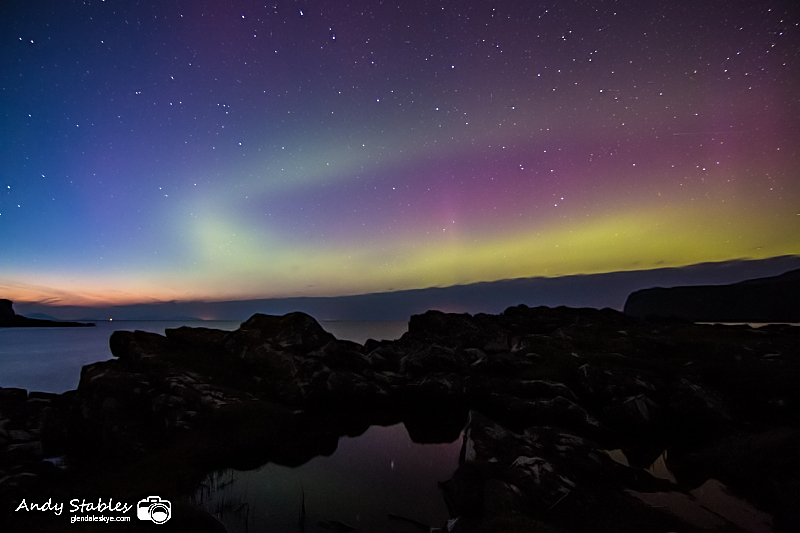 This is the second intense aurora we have experienced this year and we expect many more over this winter and next, as the sun is in the peak of its activity in the solar cycle. Colours were predominently green with some purple patches. 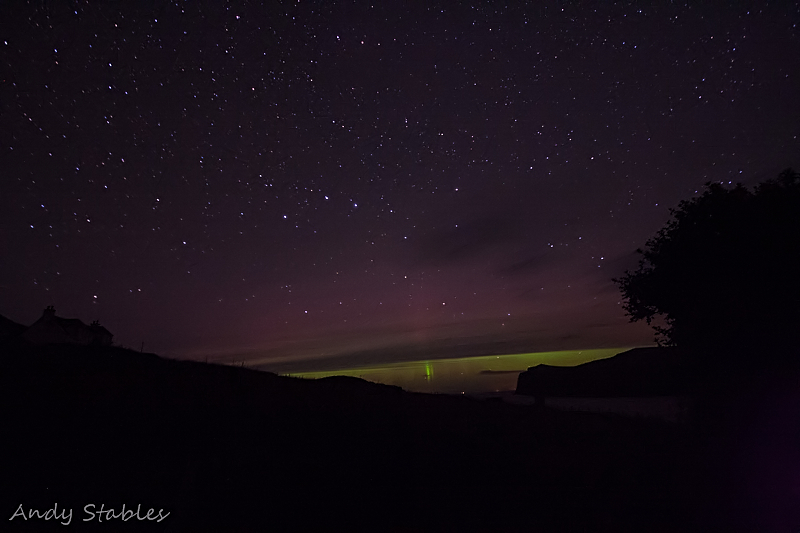 There were some extremely bright flares and one 'twister' as seen in the 2nd photo. 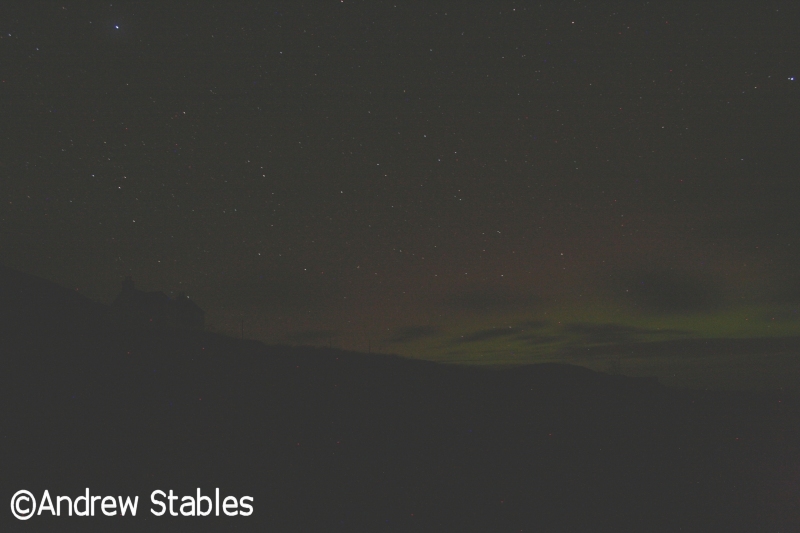 The aurora borealis was visible over Glendale this evening reaching its peak of light intensity at around 10:15pm. 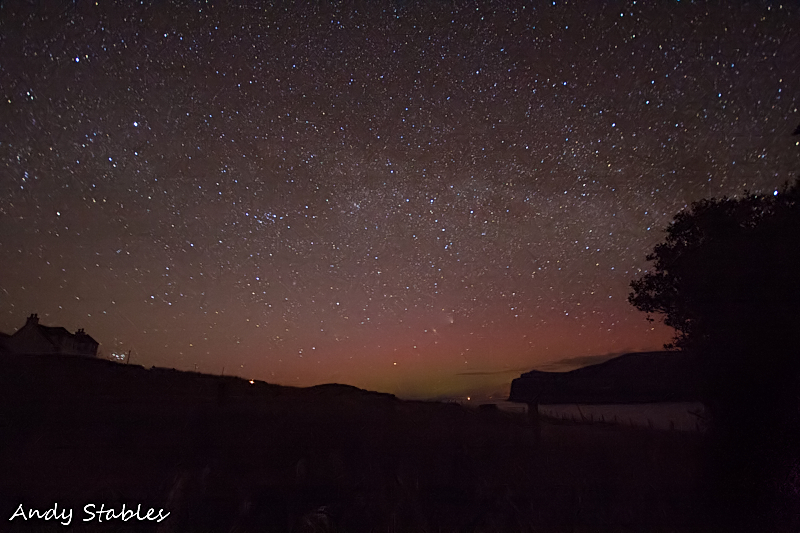 It was not as bright as other auroras over the last 12 months due to visibility being hampered by thin cloud. 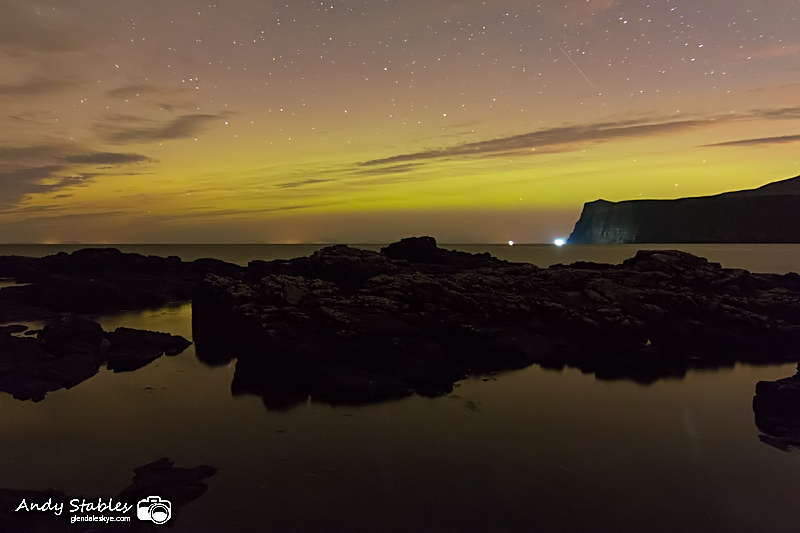 Most activity was low over the horizon, North to North-East, with a number of low bright flares, as captured in the photos. 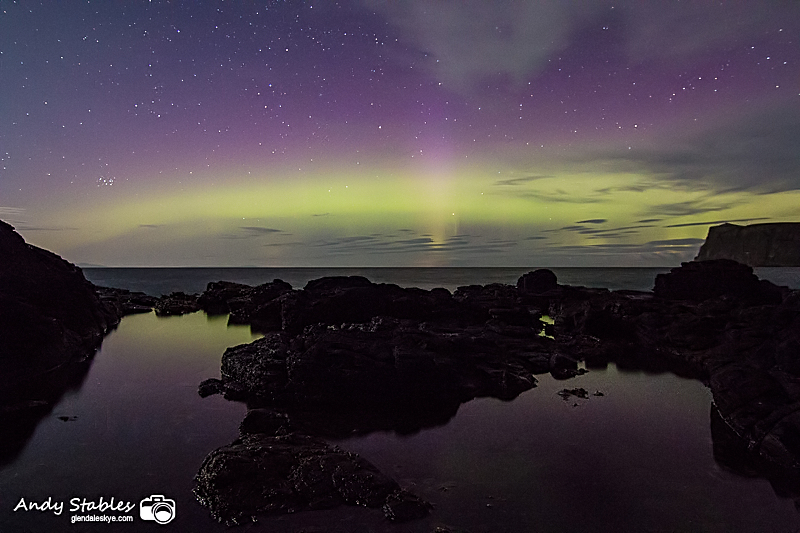 Colours remained primarily green fading to purple at greater elevations above the horizon. 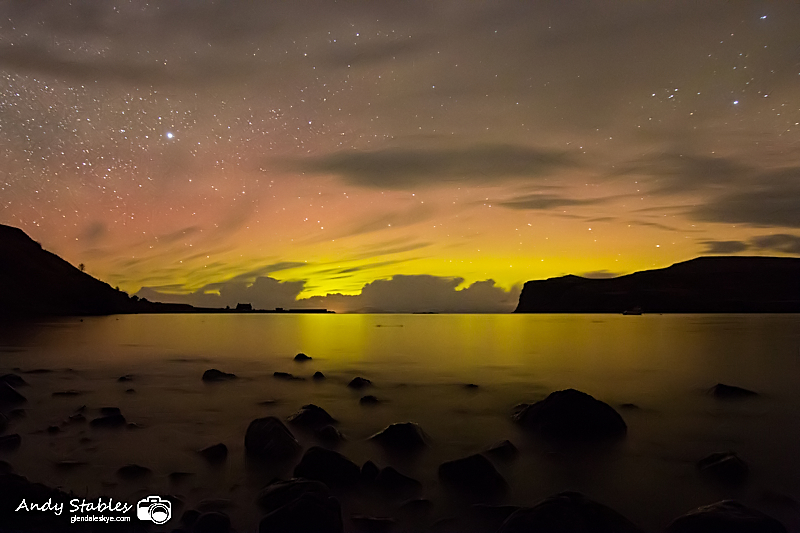 The intensity of the storm was rated at 'amber' on aurorawatch until midnight. Just when we thought the show was over, it all kicked off again after midnight with the most amazing light show seen on the island in many years. 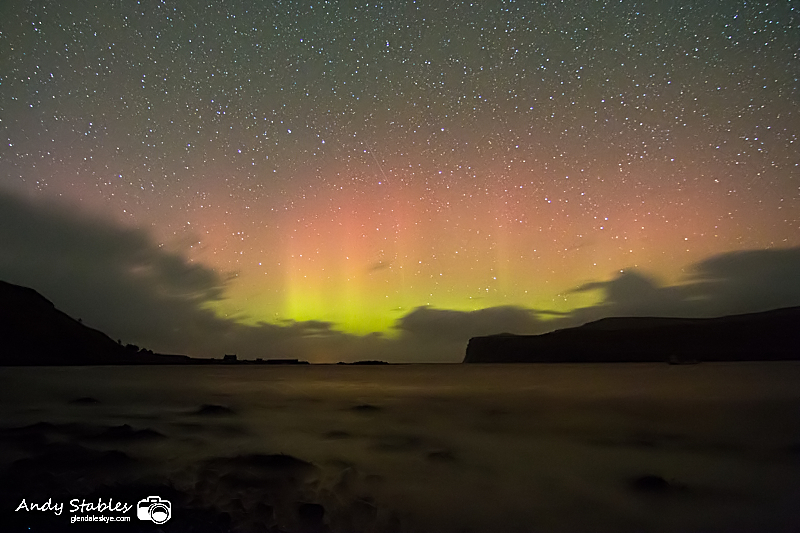 It continued until after 2am, with spectacular strobing and waves of light blazing across the sky. The main peak of activity occurred between 12:30am and 2am. 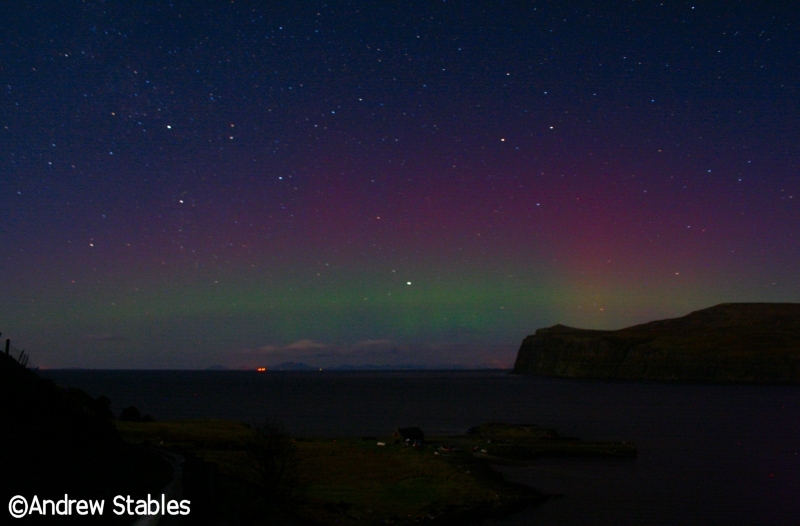 The activity was visible from East to West and also overhead, which is unusual for auroras on Skye. The third photo is looking due East to illustrate just how extensive the coverage was. There was a spectacular aurora over Glendale tonight reaching its peak of light intensity at 11:35pm, with some amazing columns and shapes. This is the best aurora we have had on Skye in many years (note the meteor on the right of the photo). 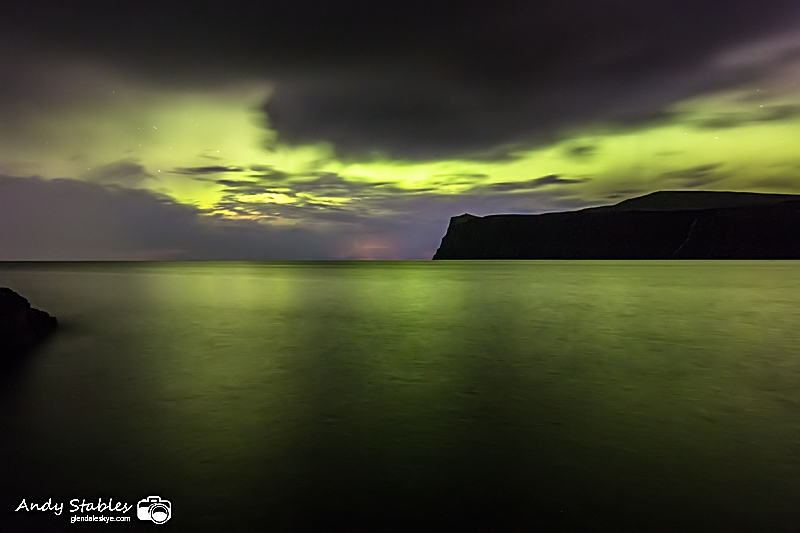 During a break in the clouds at around 10:30pm the aurora borealis (Northern Lights) was faintly visible, with three wide horizontal green bands that were merging and parting. Unfortunately, the light intensity was too low to capture with the camera. There was an amazing aurora over Glendale between 9pm and 11pm, with red, green and white light and an extremely bright auroral glow from sunset onwards. 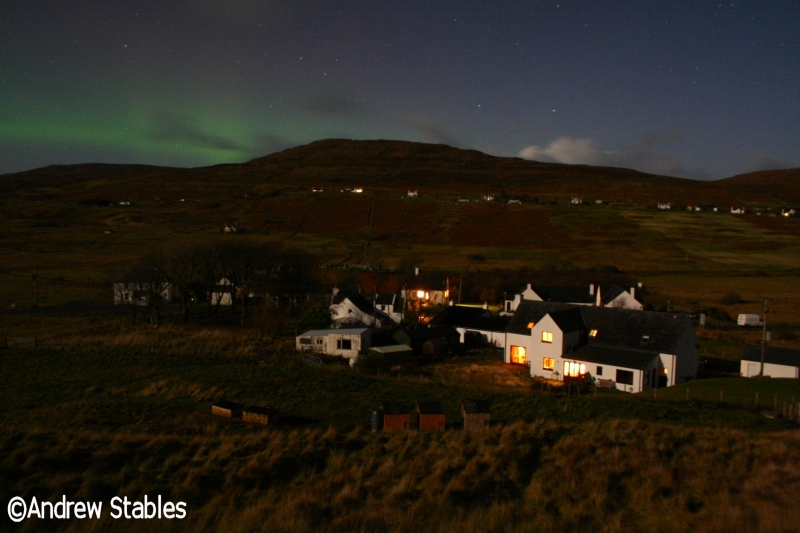 Click the photos, which show the aurora over Chrissie Matheson's house at Lower Milovaig. The photos were taken at around 10:40pm. 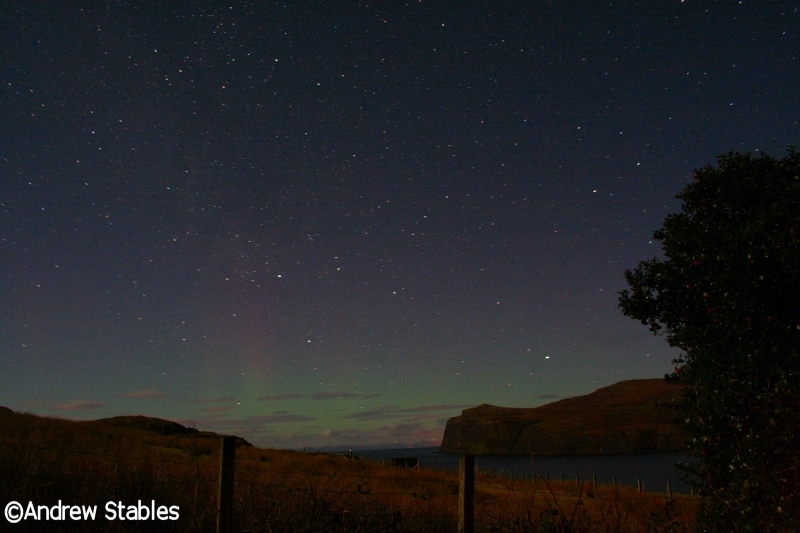 The aurora appeared mostly white to the naked eye and there was no perceptible movement.